This tour treats you to the slice of Italy that's richest in contrasts, from cities to beaches, and from rugged to glamorous. After touring the wonders of Rome, your Rick Steves guide will take you across Italy's boot to the wild beauty of the Gargano Peninsula and Adriatic Coast. You'll meander through the untouristed Puglia and Basilicata regions, followed by the must-see historic sites at Paestum and Pompeii, the jaw-dropping vistas of the Amalfi Coast, and the untamed energy of Naples. Join us for the Best of South Italy in 13 Days! Sale! Save $400 on new bookings! Fine print: You are responsible for the cost of your drinks and free-time sightseeing. See our Tour Conditions for important details regarding everything listed above. Light = 2–4 miles of mostly level walking throughout the day. Moderate = 2–6 miles walking throughout the day with some hills and stairs. Strenuous = 2–8 miles walking throughout the day with lots of hills, stairs, and uneven terrain. We'll gather at our Rome hotel at 4 p.m. for a "Welcome to Italy" group meeting. Afterward, we'll take an evening stroll through the meandering streets of "village" Rome on our way to tonight's trattoria, where we'll get acquainted over dinner together. Sleep in Rome (2 nights). No bus. Walking: light. This morning we'll tour the world's oldest museum, the Capitoline. Here we'll learn about Rome's golden age through its most treasured sculptures, including the sublime Dying Gaul, the imposing Marcus Aurelius on horseback, and the emblematic She-Wolf suckling Rome's tiny founding brothers: Romulus and Remus. Then we'll take an eye-opening walk along the east bank of the Tiber, where we'll learn about the rich, yet often-overlooked, history of Rome's Jewish Ghetto. The rest of the day is yours to wander through the Roman Colosseum and Forum next door, enjoy the panoramic city view from atop the nearby Victor Emmanuel Monument, or make a modern-day pilgrimage to St. Peter's Basilica and Vatican City. No bus. Walking: strenuous. We'll leave Rome early, stopping in the nearby hills to learn about the Roman Emperor Hadrian at the ruins of his monumental villa at Tivoli. An enthusiastic traveler and builder, his lasting legacy includes his great wall across Britain, the domed Pantheon, and his stylish beard. Then we'll drive up and over the Apennine spine of Italy, and on to the shores of the Adriatic Sea. Our destination this evening is the tip of the rugged Gargano Peninsula, one of the most beautiful areas of Southern Italy — and still unknown to American travelers. At our cliffside hotel we'll share dinner tonight, and sleep in Vieste (2 nights). Bus: 6 hours. Walking: moderate. Vieste's beaches are packed with Italians in mid-summer. But when we arrive we'll find a peaceful contrast to the hustle and bustle of Rome. Today we'll take a boat cruise (weather permitting) along the craggy Gargano Coast, marveling at the picture-perfect coves, hidden grottos, and unusual rock formations that make this coastline unforgettable. We'll return to Vieste for a pasta-making demonstration and lunch, followed by plenty of time to wander through the town or simply luxuriate on the beach. Boat: 1½ hours. No bus. Walking: light to strenuous (your choice). Today we'll head off the tourist path, continuing through Puglia and into the Basilicata region, with a stop to learn about and sample some local wines, meats, and cheeses. In Alberobello, we'll explore cone-shaped, stone trulli houses that are still lived in today. Then we'll drive on to the town of Matera, which includes one of the world's most unique neighborhoods — the Sassi — completely made up of ancient stone and cave dwellings. Sleep in Matera (2 nights). Bus: 4 hours. Walking: strenuous. With the help of a locally grown expert, we'll learn the stories of old and new Matera. We'll begin our day discovering the wonders of the 9,000-year-old Sassi. We'll go inside a sasso home to gain an appreciation for the cave-dwelling conditions endured by the residents until they were relocated 60 years ago. We'll continue our education with a visit to a rock-hewn church, and a look at the new town. You'll have the rest of your day free to wander through the different layers of Matera. This evening, watch — or better yet join — the ritual passeggiata of strolling locals in this authentic, untouristed part of Italy. No bus. Walking: strenuous. Early this morning we'll drive into the Campania region and tour an organic water buffalo farm that produces the prized local specialty, mozzarella di bufala. We'll go into the barns and learn how this tasty delicacy is made and enjoy a gourmet lunch together including (you guessed it) fresh buffalo mozzarella. After lunch, we'll continue on to Paestum, to marvel at this site's awe-inspiring lineup of three ancient Greek temples — the best-preserved collection in Europe. Then we are off to the dramatic Amalfi Coast. We'll follow the cliff-clinging road that winds above the sea to Positano, where we'll sleep (2 nights). Bus: 5 hours. Walking: strenuous. The day is all yours to enjoy the breathtaking Amalfi Coast. Take a local bus along the twisting roads and wild beauty of the Amalfi highway, hopping off to explore cliffside villages along the way or take advantage of the sea and take a public boat to the neighboring towns. Check out the sweeping views from Ravello, the candy-striped church in Amalfi town, the narrow streets and posh shops of Positano, or let gravity pull you down to a beach to relax upon. Tonight will be a great night to find a trattoria with a glorious sunset view. No bus. Walking: light to strenuous (your choice). This morning we'll make a short drive to serene Sorrento. After dropping our bags at the hotel, we'll have an orientation walk through the town on our way to watch the creation of an Italian culinary masterpiece — gelato; then you'll be free for lunch. We'll re-group for a thoughtful visit of unlucky Pompeii, where, with an ace local guide, we'll get a look at everyday life, frozen in time two millennia ago. After free time to explore more of Pompeii on your own, we'll hop aboard the Circumvesuviana commuter train back to our cliff-hugging home set amongst the lemon groves. Sleep in Sorrento (2 nights). Train: 1 hour. Bus: 2 hours. Walking: strenuous. Today is all yours. Take a boat ride to Capri, where you can then board a much smaller boat to the deservedly famous Blue Grotto. Or, spend all or part of the day enjoying Capri's remarkable views, winding lanes, fancy summer homes, and lovely gardens. Or, stay in Sorrento and wander through the shop-lined back streets, stopping to savor il dolce far niente — the sweetness of doing nothing. This evening we will meet for a home-hosted dinner with a local Sorrento family. No bus. Walking: light to strenuous (your choice). After a morning drive, we'll have an easy introduction to Naples at the beautiful hilltop Museo Capodimonte, home to southern Italy's best collection of Renaissance paintings, including masterpieces by Raphael, Titian, Caravaggio, and El Greco. After lunch in the city that invented pizza, we'll be introduced to Naples' grittier side on a Vespa-dodging, laundry-flapping, slice-of-Neapolitan-life walking tour through the heart of this chaotic, memorable city. Sleep in Naples (2 nights). Bus: 2 hours. Walking: strenuous. We'll begin our morning with a visit to the serene Cappella Sansevero, home to amazingly lifelike sculptures that have to be seen to be believed. We'll continue touring the greatest treasures of Pompeii, brought to Naples' National Archeological Museum for safekeeping. We'll also be dazzled by the Farnese collection, including the largest single sculpture ever recovered from antiquity: the Farnese Bull. This larger-than-life riot of animal, human, and divine struggle was adored and painstakingly restored by Michelangelo. Then, armed with the confidence and Neapolitan street smarts you've learned from your guide, your afternoon is free for making your own discoveries. Tonight we'll get together for a special dinner to share travel memories and toast new friends. Salute! No bus. Walking: moderate. Breakfast is provided, but there are no group activities today. It's a breeze to reach Naples' airport by taxi, easily arranged through our hotel. Your guide will help you with any post-tour planning, leaving you well prepared for the road ahead. Grazie e ciao! Carry/roll your luggage over uneven pavement (possibly several blocks) and up stairways to reach your hotel, then up several flights of stairs to reach your room. Be on your feet, walking and standing for up to three hours, indoors and outdoors, in all weather conditions. Sleep with street noise and no (or weak) air conditioning. After orientation and transportation lessons, be able to navigate towns and cities on your own. Sleep in a cave-like hotel room in historic Matera. Navigate steep and/or uneven surfaces like cobblestone, slick stone and marble, as well as unmarked obstacles at ancient ruin sites. The itinerary was great. Good mix of big towns, small towns, archeological sites, side trips and both coasts. "Seeing Matera from across the valley. Unbelievable at first site and even more so once we got into the old town." I chose the South Italy tour because it included Pompeii and the ancient town of Matera. I have a keen interest in archaeology and history and knew I would enjoy the tour but it exceeded my expectations. The sheer amount of history imparted by our tour guide and the local guides was impressive. They brought to life the history of the places we visited, providing context for the things we were seeing. All of the places on the tour were fascinating. "It's hard to pick just one. Seeing ancient frescoes in situ was wonderful. And I was stunned by the beauty of the sculpture Christo Velato (Veiled Christ) at Sansevero Chapel Museum in Naples." This was my 16th tour and it did not dissapoint. . I wanted to get to know the south and what it has to offer as most people stop at Rome.I also wanted to experience the beauty of the Amalfi Coast and got a taste of the glamour of Positano. I loved that we were also on the Adriatic on this tour. This tour was very active, lots of uneven pavement, stairs, lots of walking. Good balance of free and group time, I loved the free days in Positano and Sorrento. And the food..Mama Mia! "I had wow moments daily. The view of the Forum from Capitoline Museum in Rome.The views of the Adriatic from Our cliffside hotel in Vieste. The boat trip in Vieste. Staying in a cave hotel in Matera. The Greek ruins of Paestum. Positano and the Amalfi Coast. Just driving on the roads of the Amalfi Coast make you scream wow. I had to pinch myself when we set foot in Pompeii. To see the frescoes, murals still intact after 2,500 yrs and look up and see Vesuvius. The grittiness and energy of Naples"
Overall, I give the tour 4 out of 5 stars: The tour itinerary was excellent, the tour guide Nina, Massimo the bus drive, and local guides all exceeded my expectations and were excellent, and the group dynamics was very good. I am taking away a half star for the food / menus for dinners and a half star for being too rushed at all the archeological sites. I think the Rick Steves tour book may exaggerate the crime of Naples and instill more fear in folks than warranted. "The exceptional personal moments with Italy: The home-hosted dinner at Teresa's and Luigis in Sorrento; Paestum / Pompeii / Herculaneum Buffalo farm"
I liked the tour. It was paced well. I had enough time to do some things on my own and I liked the variety of the experiences. ie. art, history, buffalos, caves, dining experiences, etc. Our tour guides were interesting and informative and Nina was very engaged, organized and helpful. "Matera had to be the big WOW because I had never seen anything like it and our cave hotel room was great. What an amazing environment!" This tour delivers! It was great to see southern Italy as it is so different from northern Italy. I found this tour to be a little slower paced as there are the two free days, which I liked as it allowed me to tailor the tour to my likes. "One wow moment was the boat cruise from Vieste - beautiful scenery, fishermen with their just-caught octopuses, and surprising little red jellyfish! Another wow moment was learning about the Sassi people and their cave dwellings. But perhaps my favorite was the water buffalo farm and how well they were treated (I want to be one of those water buffalo in my next life!)." My overall tour experience was wonderful!! Beginning with gritty and charming Rome, to magical Vieste, mind blowing Matera (with overnight stay in a cave), swimming in the surf and seeing the ferries back into the cement landing with crashing waves in Positano, great stay in Sorrento with day at Capri (great shopping here) and Naples with a lovely conclusion to bring together all the history we learned from our brilliant guide. "My favorite wow moment was the boat ride in Vieste. We saw the proud squid fisherman show off their catch from the rocky shores. Our expert boat captain knew every inch of the coast and navigated his boat into several caves! !The water was a brilliant aqua marine color." Second RS trip and both outstanding with great tour guide ,ideal hotel locations and en;tightening experiences. "Many but the family prepared meal in Sorrento ." "Dinner with the family (Luigi et. al.) was fantastic. The food was some of the best we had during the trip, the homemade wine was undoubtedly the best we had on the trip, but the experience of sitting down and getting to know, if only for an evening, those wonderful people was the highlight of the trip." Tour exceeded expectations, and expectations were high based on previous experiences. We have been on a couple of my way tours and were curious about the more structured guided tours. The cultural experiences and the local guides added so much more to the tours, making the guided tours a great value. Perfect balance of tour time and private time. "Many wow moments. The dinner with the family in Sorrento was outstanding. A fabulous cultural experience and a culinary delight. Seeing Pompeii, the excellent local guide and then the follow up at the Archaeological Museum brought together a story I learned about years ago but really didn't fully understand. Napoli was way cooler than I expected. Thanks to Nina for opening my mind and eyes to see more than motor scooters and grafitti. Naples is not as scary as the book suggests." My wife, Susan, and I discuss the tour and have agreed. Please read the details on her evaluation. The tour was excellent! We expected it to be. We love to research the history and places the tour will take us, making use of RS lists. And then we count on learning and experiencing so much more. We've never been disappointed and we've been on several Rick Steves tours! We also enjoy the camaraderie of traveling with very interesting nice people. "My wow experience was seeing the beautiful, wide expanse of the Bay of Naples from different cities and vantage points! And of course learning more of its history." I loved the tour. I thought the itinerary was very well thought out with lots of free time, yet a perfect amount of group time as well. "Every day had something special. Really." Every Rick Steves tour has been the best yet and this was no exception. The cities and sites of the tour were outstanding, the information provided was informative and the overall tour guide as well as local guides were absolutely terrific. My husband and I thoroughly enjoyed this tour. "Viewing the Sassi of Matera was the wow moment. The close second was the tour guide's explanations during the tour of Pompeii." Exilerating, highly informative experience. The cities and sites were outstanding. "Viewing the Sassi of Matera for the first time." Tour was paced very well, itinerary was wonderful, the Guide fantastic. I enjoyed all of it. I followed in footsteps of Italian family & ancestors & basked in Italian heritage...a great experience. The Guide managed & negotiated the tour perfectly, she looked things up if she didn't know the answers immediately (tho need was rare!)... this was deeply appreciated. I really learned a lot during tour! I was impressed with mid-tour eval request. LOVED bus driver, saved our lives many times! "Human nature has not evolved very fast or consciously after all....explaining some of the same repetitive & primitive behaviors ... So, current politics are just a blip in the same time line....future time travelers will shake their heads in wonder & sadness at us too as they "step in our footprints".... This knowledge was not really brand new to me, but it finally "clicked" as a "WOW" moment in understanding....Perhaps my assessment of the "state of things" will evolve....This would be good..."
The tour overall was fantastic. Andrea was a wealth of knowledge wrapped in a constantly happy and smiling package. I knew we were going to have lots of travel between destinations but I would have liked a few more days at the Amalfi Coast to just relax. I could have skipped the Trulli homes to get to the coast sooner. "Matera, absolutely loved the area"
My wife (Cindi) and I have never been to Europe. We were nervous doing this; your tour was so organized and comfortable. My ancestry was from Southern Italy. To experience the culture and warmth (not to mention the food) of the people in the five cities/towns that we stayed was amazing. "1) Andrea arranged for us to see a presentation of Napoli folk music--wow 2) In Sorrento- the dinner at the home of Luigi and his family. 3) In Naples--meeting a couple of Andrea's friends in their apartment for snacks and drinks. 4) The Trulli houses and the lunch there 5) Everything about Matera 6) Taking the train to Pompeii--and then Pompeii 7) How well 'prepped' I was in every experience I had"
This tour was fantastic and well worth the fast pace. It was a nice change from the big city hustle and bustle of the 17 day Best of Italy tour I had just been on. There was a cancellation, and decided to go for it! Back to back dates really work out well for these tours. I really appreciated the non touristy places this tour visited. "There were many on this tour. The boat ride in Vieste on the Gargano coast. Mozzarella di bufala experience and lunch in Paestum was wonderful! The home hosted dinner in Sorrento with Luigi and Teresa was a fantastic local experience. And my favorite experience was the music concert in Naples. Napulitanata. A true Neapolitan experience!!! This wasn't even on the tour agenda. Our guide Andrea knew about it and so happy she suggested it to us!!!" The Best of Southern Italy Tour far exceeded our expectations. We had an excellent tour of the Capitoline Museums with Francesca. The experience was outstanding from the view and dinner at our cliff side hotel in Vieste to the cave hotel in Matera. We enjoyed seeing and learning about the historic trulli houses in Alberobello. Our tour guide, Andrea, provided excellent historical details in each area we visited. The tour of Pompeii was amazing with a glimpse of everyday Roman life. "My favorite "wow" moment was the view from our cliff side hotel and boat ride in Vieste." Wonderful time. Everything professionally done. The entire experience was top notch. "Coming down the cliff road to Positano. Beautiful and scary!tv"
I found it to be an outstanding tour of an Italy that was off the beaten tourist path in many respects. I learned about the people and places of southern Italy while also visiting beautiful and interesting places including Positano and Pompeii. The guides were terrific as is usual on a Rick Steve's tour. "The city of Matera with its history of cave dwelling people up until the 1950's was a revelation. And the rehabilitation of those caves into hotels, homes and restaurants was amazing." "So many wow moments but going to Luigi's and Teresa's home for dinner just summed up what Italy is all food, family and history Matera was just so touching to hear about the peasants that lived in caves and were then forced to leave their homes and hav3 to adjust to whole new way of living and the shame the people from that area still live with today Of course the Coast was just breathtaking Gelato can you ever have too much"
This tour Introduced me to parts of Italy - south of Rome and north of Sicily - that I had never seen before. I experienced breathtaking land- and seascapes and stunning architecture, and I saw and learned more about the divisions that inform Italy's chaotic politics and divide it, still today, into north and south. The tour was rigorous. I am 72 and, although I trained for the tour, I still found it taxing due to the hilly terrain and stone steps, often without railing. "My favorite wow moments were those on boats: viewing the gorgeous cliffs of the Gargano coastline from the sea and marveling at the limpid purple, green and turquoise waters of the deeply recessed grottos; seeing Amalfi appear around a craggy bend on deep navy-blue seas; imagining the small islands of the Amalfi coast animated by their ancient mythic personas." Excellent. Informative and helpful tour guides. Wonderful selection of places to visit. Friendly traveling companions. "Several moments stand out: the coast of Italy, dinner with the family, and visit to Pompeii and the museum with artifacts from the city." A truly outstanding exposure to the South of Italy. What a pleasure to be educated about and experience the history, language, architecture, food, wine, and people of Southern Italy. "Matera! Learning about the squalid history of the cave dwellings that were evacuated in the 1950s and then being able to stay two nights in a cave hotel as part of the current Matera renaissance, having lunch on our own in a restaurant overlooking Sasso Barisano, walking the evening passegiata with locals, and having great gelato." It was eye opening, educational, inspiring, and absolutely wonderful! The food was bountiful and delicious. Everyday was packed with new and exciting experiences. "Matera ia the first thing that comes to mind but I loved the chairlift ride to Anacapri. Also the Naples performance of the Napulitanata Theatre group." "The overall beauty of the country wowed me the most." This tour was nothing short of amazing. I had such a wonderful time. I have never traveled with a tour before and was, admittedly, skeptical. No more. I would not hesitate to recommend a Rick Steves tour to anyone. Several of our tour companions had been on one or more Rick Steves tours and were back again. Can't get a better recommendation than that! We traveled with a great group of people. Those who had been on previous tours said that was their experience every time. "This is a tough question. So many "wow" moments. OK, if I have to pick one I think it would be our first look at the caves/cave houses in Matera from across a large ravine. Breathtaking view." The tour was well planned, organized, and [INVALID]d. Some of the sights and activities were a little off the beaten path, which was nice. I was worried about long bus rides taking away from our sightseeing time, but I was pleasantly surprised at how much we managed to see and do. The amount of walking we did each day was reasonable. "My favorite cities were Alberobello and Matera. The trulli houses and cave dwellings were amazing! My favorite "wow" moment in Alberobello was the wine/meat/cheese tasting. The shop owner's pre-teenage niece helped me choose marmalade and cheese for our tour group's antipasto social. She was unbelievably knowledgeable, enthusiastic, and helpful for one so young. My favorite "wow" moment in Matera was seeing the Sassi in Miniatura. It was incredible!" This was my first European trip and Rich Steve's trip. I truly had an amazing experience. My trip to Southern Italy was beautiful. The rich history, beautiful people, food and wine was exceptional. "My "wow" moment was simple, my experience just walking and enjoying the sites and walking the streets with all the citizens of Italy. Enjoyed watching the real life of all age groups. Such a beautiful country." We've spent time in Northern Italy but had never seen Southern Italy. We weren't sure what to expect, but this tour exceeded all our expectations! Southern Italy has a host of interesting cities, towns, culture, ancient Greek and Roman history and art, and we were constantly amazed at the things we learned and saw. Our guide, Caterina, made everything come alive; and our local guides added such depth to our understanding of what we were seeing. We'd highly recommend this tour! "Finally seeing Pompeii, with a very competent guide, after reading about it for decades. A truly amazing window into city life centuries ago. NOTE: This evaluation reflects comments from Fred, as well." Overall, a wonderful experience! Great hotels and service, lovely food, and amazing local guides. The part of tour in Sorrento were a tad overwhelming and taxing. "Boat ride to grottoes on the Gargano Peninsula, water buffalo farm. Pompei and Rome plus Naples museum collections." It was a great tour. Happy to have gone on this trip. It's very hard to rate a tour when you have been on a few others. As you tend to compare them and not rate them just on their own merit.That said, I would rate it very good. I picked this tour for specific sights I wanted to see. Was disappointed then when we were only allowed 30 min to explore Alberobello, since the trulli houses were one thing I really wanted to see. I enjoyed the wine and food pairing there and would not want to take away from it. But we really could have used more time. "Cappella Sansevero,amazingly lifelike sculptures, The Veiled Christ. I could not believe it possible to create something like this in marble! The neting on the Disilluson was incredible. Our guides also got us in to see the Teatro San Carlo Opera House and it was fabulous. Naples was my favorite and most unexpected WOW! This city deserves it's own 7 day tour." Amazing! I have never been on a trip like this. It was a true once in a lifetime trip for me. The sights were breath taking! The art masterpieces and architecture we saw will stay with me forever. So much history. Absolutely worth the trip. Our guide was so sweet! "Seize the day" was her motto and she does it well! I can't imagine doing a trip like that without a guide. So much information would be missed without a guide. Our local guides were amazing also. So knowledgeable and entertaining! "The scenery, the coast line, was my "wow" moment or moments. I just had to take some time alone to take in the beautiful views and pinch myself to make sure it wasn't a dream. I am most at peace in nature more than in the cities. The cities were interesting and exciting but the quiet sunrises and sunsets spoke to my soul." I enjoyed this tour. It had bit of everything - museums/arts, scenery, food/wine/gelato (ok, lots), big cities, small towns, seas, mountains... My fellow travelers were great company. Our wonderful tour leader, Caterina, through her enthusiasm, love, and knowledge of South Italy made sure that we had the best experience possible. Great mix of group activities and free times. Great local tour guides. So happy that I had the fantastic Francesca again for Musei Capitolini in Rome. "Multiple moments... Vieste/Gargano Peninsula - tranquil and beautiful grottoes. Matera with its sassi - wow! wow! The view of Matera from that viewpoint!! Pompeii with a tour guide, Gaetano, who made it came "alive." Dinner at Luigi/Thresa in Sorrento - fantastic experience. Veiled Christ in Naples' Cappella Sansevero was stunning. Not part of the tour, but I loved my visit of the island Procida in Bay of Naples." The trip was a good educational experience. The only reason I didn't rate it as outstanding is because I am an independent traveler and rarely take tours. The downside of tours is you are locked in a schedule. The upside is it makes travel logistics a lot easier. "The trip to Capri with Mondo (90 Euros) was the highlight of the trip especially the swim in the Mediterranean. At first I thought the price high but when you add the drinks and snacks (which served as lunch) and the convenience of being picked up at the hotel, the price was well worth it. The captain and crew were a lot of fun." I thoroughly enjoyed this trip. Our guide, Susan was excellent: knowledgeable, patient, and fun. The itinerary was comprehensive and very interesting. I also thought the local guides were very good. "So many wow moments: Pompeii (fascinating), Ravella (charming), Amalfi coast and Capri (beautiful)"
Just like my first tour last year, this trip was wonderful. Wonderful guide, Susanna, wonderful group of friendly people and great local guides, especially Francesca in Rome and Gaetano in Pompeii. I learned so much and saw beautiful places.I was really surprisingly impressed by Naples. The trulli houses and the caves of Matera were truly one of a kind. I also appreciated being taught how to use the local transport systems. "Riding the chair lift over the landscape of Capri was my favorite part of the trip. The quiet of being alone and having the 11 minutes of just looking was perfect.Second was learning just how clever those folks at Pompeii were, so clever that we still use their ideas today." I enjoyed the trip and am considering scheduling another Rick Steve's tour. The locations visited were terrific except for Naples. Pompei and the two museums were great but not so excited about the city itself. Our group was wonderful with no high maintenance or late folks. Everyone one was friendly and easy to talk to. We had plenty of free time and the weather was accommodating except for two rainy afternoons. The trip had been recommended by a friend who took the trip the previous year. "I loved the trip to Capri with two other couples. The day was beautiful and the visit to Augusto's Garden enabled us to see the other side of the island. We kept seeing other folks from our tour which enabled us to take group pictures." This is a great tour! Predictably, the only significant issue is needing more time in each location. We enjoyed our trip very much. Susanna did a wonderful job. We found 13 days to be to long. Although we saw some wonderful places we would have rather stayed at some of our destinations a day longer and seen less sights. Our visit to Hadrian's ruins would have been much better with a guided tour. Hadrians ruins was very interesting but hard to follow with no guidance. "We loved our arrival in Positano! Great hotel and beautiful view from our balcony! Pompeii was awesome! Our guide at Pompeii was outstanding!! He brought history alive! Our guide in Rome at the Capitoline was Francesca. We were blown away by her! Again she brought history alive! I think ending the tour in Naples is a little disappointing. After all the wonderful things you have seen on this tour and then ending in dirty,crowded,noisy Naples is a let down. The tour should end with a bang!" Excellent guides, hotel location(but one), less suitcase carrying than other trips. Tying together the ancient to the present history of Italy. Happy to have italian heritage. Nice people. Tour guide, Susanna, Really knew the areas visited and was always diplomatic, always helpful. "All the info from the private guides. And the SERENE chairlift ride on Capri. It was was wonderful being alone and quiet and just having the time to look at scenery." It was an exciting tour of Southern Italy with new adventures everyday. The guide was great and the people on the tour were very nice. It was mostly couples and there wasn't too much mixing of table seatings at meals. On my previous Rick Steves tour, even though I went with a few women friends on both tours, there was much more flexible groupings. At the initial hotel in Rome, the table seatings were arranged in sets of 2. This didn't encourage sitting with a new friend. "I honestly don't think I could pick just one. The boat ride to Capri and the Blue Lagoon trip was fabulous. The boat ride to the grottos of Vieste was great. The local guides were phenomenal." Rick Steves continues to deliver. We had great fun, learned alot and felt like we had some unique Italian experiences. We also love the attention to food and wines, which we looked forward to at each group event. "Swimming in the Adriatic at Vieste at the beach on a beautiful day below the cliffs had to be the best moment among many. I completely underestimated the history and beauty of both Paestum and Hadrian's Villa at Tiovoli. Matera was also a great surprise." "Matera - who knew it is such an incredible place with fascinating history?" This was my first Rick Steves tour and I did not know really what to expect. I was pleasantly surprised at the first group meeting and was made to feel welcomed. Patricia, our tour guide, was amazing. She was professional, yet extremely funny. She also made sure every person's needs on the tour was taken care of to the best of her ability. She also had to make some changes to our itinerary due to weather, road closures, etc., and she did this all behind the scenes! She was amazing!! "My wow moment was stepping off the bus to look across to the city of Matera. What a site! Then actually staying in a cave and experiencing all those steps and rocks with no grass. I could not have imagined living there 60 years ago. The parades at night and the view from the room in Matera was truly a wow moment. Also my second wow was in Vieste and being right on the beach, listening to the waves crash at night. That was simply lovely!" The tour was wonderful. Our tour guide, Patricia, was fabulous. She made an excellent tour even better. "Revello on the Almalfi Coast was my wow moment. It was so beautiful, not crowded and had excellent food and views." "One night I was in the Plaza Navona and a young lady was playing the violin so beautifully while standing in front of the Four Rivers fountain. Special moment." This was my favorite trip ever! Patricia was amazing. She was so much fun and so helpful with everything. She worked really hard for us (esp when the road closed) but she made it look so easy and fun. Each of the places that we visited were amazing. I would consider redoing this exact same trip. All of the people in our group were great travelers and we made a lot of new friends. I can't wait to go back to Italy again. "I loved the Amalfi Coast. I told my kids when I got back that when and if they get married some day, they should honeymoon there. Of course, Pompeii really was amazing." Our guide was wonderful, and just being in Italy was great! The weather was good, and even when rain was called for, it stayed dry. Everything is always so well organized, so it just makes the whole experience unforgettable! "I got to see the Rome I was expecting when I stepped to one of the windows in the Capitoline Museum, and looked out. There were some of the beautiful ruins spread out in front of me--THAT was the Rome I was expecting, and even though I had seen many fabulous sights, I had not seen exactly what I was expecting until then. The single thing, though that took my breath away was the sculpture of the Veiled Christ at the museum in Naples. I shall NEVER forget that! That was my very favorite!!" As usual, there was good mix of scheduled time and free time on the tour. "My favorite moment was having dinner in Sorrento at Teresa & Luigi's home. It is so gracious of them to open their kitchen to Rick Steves groups. The food was all home cooked and delicious. But even better was the way they treat you as family. Everyone was so kind. It was a special evening!" This was a wonderful whirlwind of a tour! Several times I had to pinch myself as I couldn't imagine the beauty I was experiencing was real! Our group was amazing, and I felt like I was traveling with friends within a few days. I especially delighted in visiting Luigi and Teresa's home in Sorrento, where an amazing meal was served. Also, the home of Patricia's friends in Naples was a lovely experience. The Pompei tour was fantastic! "So many wow moments. Pompei was a wow for sure. Vieste on the Gargano Peninsula was beautiful, and I think an extra night in Vieste would have been perfect, as there was not enough time to explore the town. Matera was another WOW moment, with the history of the cave life etc. Most of the tour members were given rooms in the caves, but unfortunately there weren't enough for my sister and I. The meals here were amazing, and we agree that the best pizza we had was in Matera." We enjoyed every minute of this tour. Our tour guide, Patricia, was wonderful. The entire group of travelers was fun and congenial. The areas visited were very interesting and beautiful and new to us. We didn't know much about southern Italy neither from pictures and books nor from any previous visits. Except for the Amalfi Coast and Sorrento - we had heard and seen a lot about that. So many of the other destinations were equally beautiful in different ways. "So many to choose from, but just being in our cave hotel in Matera was very special. The view was so peaceful in the evening while drinking a bottle of wine on our terrace overlooking the town. Matera was a surprise: it reminded me of a small version of Cappadocia in Turkey"
The trip was great! I enjoyed meeting people from all over the US and our guide Patricia made the trip educational and a lot of fun. "I enjoyed the Amalfi coast and all of the great views from Capri." Love the small groups and time on our own on your tours......We have done several tours by ourselves and this is a nice transition to a more structured guided tour. Patricia, our tour guide did a wonderful job of navigating us through Southern Italy. She adjusted our schedule nicely when weather did not permit us to do a boat ride in Vieste and a fire made us reroute our bus in Positano. We loved her little apertif perks and entertaining history lessons about the region. "Capitoline Museum tour and tour guide Francesca....We will never look at a museum tour in the same way after her discussion of how to really appreciate art in an observant and studied way....Also the beautiful rugged Amalfi coast......and the lovely villages climbing up the hillsides! Mozart and massages at the Buffalo Mozarella Farm!" "Definitely the dinner with the family. Great food and company, and the house reminded me of those we had just seen in Pompei." This was our first Rick Steves tour. Although we have had friends tour with the company always returning with positive reports, we had no idea how wonderful the experience was going to be. Our tour guide, Patricia,simply made the trip magical by bringing the country to life for us. We were extremely pleased with the experience and will be booking another tour in the near future. Bravo for the organization, hotels, meals, experiences and great local guides. "Pompeii has to be at the top of the list and what made this experience so great was the local guide. He had us living in the moment with his very artful way of describing life prior to the eruption." This was an interesting tour, a history lesson almost every day. We had a good group. This tour was probably the most strenuous of the 15 we have been on. "There is a toss up between Paestum with the Greek temples in remarkable shape and Pompey." This was our first visit to Italy. We would book another tour without hesitation! Excellent in every way! "The private tour guides were excellent! We were in awe of our experiences!" This was our first RS tour and without a doubt it won't be our last. From the selection of cities and sites, the choice of hotels and eateries, to our full time and local guides, everything was outstanding. Every place we went, everything we did and learned was new and fun and wonderful. All the guides enriched our knowledge and appreciation for all we were seeing and doing. So much better than wandering around on our own. Fellow travelers enriched the experience as well. "So many, but two come to mind. Our tour of the Capitoline Museums and Jewish Ghetto in Rome at the beginning of the trip with the amazing Francesca set the bar high for everything to follow. Our last tour at the Cappella Sansevero in Naples with the breath-taking sculpture of Jesus covered in the veil led by the fantastic Josephina was a revelation. Everything in-between was pretty great as well." "Matera was the highlight of the tour"
I enjoyed the tour very much! The itinerary was well balanced with enough time to see the sights and to relax. The tour director was great which added to the experience. We also loved all the local tour guides especially Francesca in Rome. She was a super star! "Matera was our absolute favourite town on the tour." Italy truly is an incredible country to visit. I love the emphasis on quality food, wonderful wine and warm relationships with people who appreciate good company. Also, it's mind boggling to encounter such an amazingly rich history. "I really appreciated Francesca's tour in Rome that helped bring the history to life so you could relate to the art/culture/people much better than simply reading brief descriptions of what was on display." I enjoyed the variety with time first in Rome and then to the smaller towns. There was a mix of visits to museums like the Nat. Archeological with relics from Pompeii, cultural immersion including a group dinner at a home hosted dinner, free time, awe inspiring sights traveling along the cliff road of Amalfi coast to Positano, the 2000+ year old historical sites of Greek temples at Paestum and the preserved site of Pompeii. Our guide Tomasso was very good as well as the individual guides. "First was the view from our room at Vieste. Another was the rocky cliff road along the Amalfi Coast with views of the sea on our way to Positano. Seeing the preserved sites of Pompeii and size of the site was a WOW moment along with the Greek temples at Paestum." The tour was excellent and our guide exceptional. Tommaso was organized, and very knowledgeable. He was also willing to answer any and all questions and offered personal insight into the Italian lifestyle and health and education system.The local guides, especially Francesca in Rome, were fantastic. Francesca is a real gem, and taught us how to really look at art and transport ourselves back to the time and place the piece was made. The bus driver was outstanding, a true professional. "The stay in Matera was a highlight. Sleeping in what used to be a cave house was fun. Learning about the history of the town, and touring the city was terrific." We were wowed from the start by our Rick Steves tour of northern Italy two years ago, but southern Italy snuck up on us. By the end of the tour, we were impressed by the richness of the lesser known and sometimes under appreciated places of this region, such as Hadrian's Villa, Alberobello, Matera and Naples. 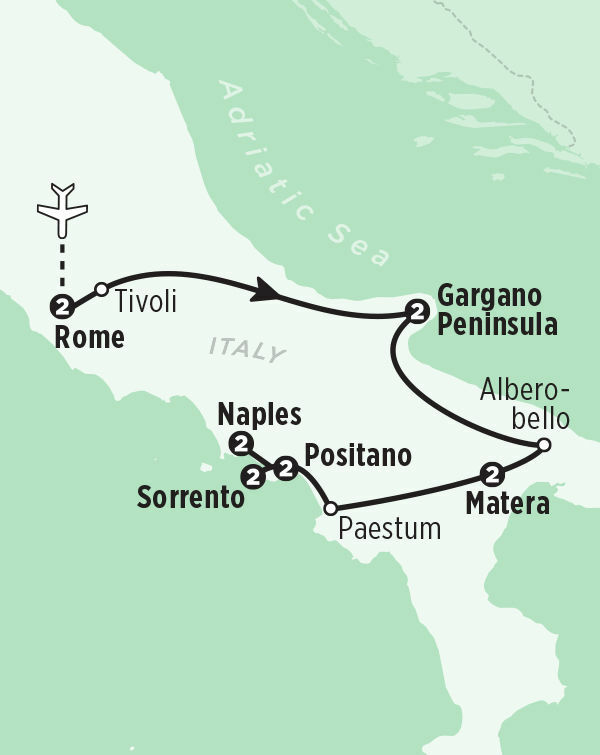 Add to this Sorrento, the Amalfi coast and Pompeii and you have a five star experience. Well done! "That's easy--the splendor of the Amalfi coast. Also, we were pleasantly surprised by Naples--world-class museums, excellent food,labyrinths of intriguing side streets,layers of history, crazy but controlled energy, beautiful vistas (atop the funicular at night) and a pizza I'll never forget. Rick, Naples deserves more credit!" We were totally satisfied with our experience and would recommend it to others. It was a perfect fit for us! It was not fancy yet we felt catered to. The scheduled activities and tours were plentiful and enjoyable yet we had a good amount of free time to relax or explore on our own. We appreciated the structure of the tour which gave us freedom from worrying about where we were going to go, how we were going to get places, etc. The pace was perfect. We are RS fans for life! "There were so many! The beauty of Positano, the location of the hotel and view from our room will forever be a magical memory! Our stay in the Sassi and the local tour was extraordinary. I could never have imagined such an experience. Our visit to see "The Veiled Christ" was a magnificent surprise! It was the most emotionally moving, powerful experience I've ever had with a work of art. Thank you, Tommaso for making that possible. It was unforgettable!" The tour was everything that me and my wife had hoped for in a first visit to Italy. Learning how to appreciate the ruins, the art, the people was all a testament to the tour guides. The provided perspective, which allowed us to envision what life might looked like at the sight of the ruins rather than just seeing old buildings. We loved the tour. "There were many wow moments. We loved the beauty of Positano, the caves of Matera, the quaint restaurants and the dinner with an Italian family. The hotels were conveniently located and the tour provided enough activity per day but also free time for us to see more if we wanted to do something on our own time." The tour provided more than expected tour guide superb as well as local guides. You thought of everything! I can't say enough about Caterina. She was outstanding, so knowledgeable, so kind, so efficient. She was just excellent. The hotels were wonderful, quaint yet immaculate. Traveling alone I am a ways a bit concerned but I felt safe and secure at all times. For me personally, the trip was a bit strenuous but that was my choice, you made it more than clear what the physical demands were but Caterina took such good care of me. I will recommend your tours highly. "I have been to Italy many times so for me my WoW moment was the wonder ful people on the tour and how kind they were to me"
We love Rick Steves' tours. We love the quaint boutique type hotels that are centrally located, the family owned restaurants where we have our team dinners, and the side demonstrations unique to the area. The tour guides teach us about the culture of the particular regions that we are visiting. "Matera -- the city is a collection of caves. Our hotel was a cave. We were taught that it wasn't always the beautiful city that it is today. It was very poor. And it is now revitalized." Another excellent tour, our 4th. Caterina was an excellent guide. It seemed like each day produced a new "wow" moment. "During WWII my dad was responsible for getting the electrical system working in Naples when the allies took control of the city. He worked very hard to accomplish that goal. Because there were satchel charges in the generating plant, his first source of electrical power was a submarine in the Naples harbor. Stephen Ambrose, in his book "The Supreme Commander" wrote "The engineers worked miracles in Naples to get the infrastructure working." That was my dad. Naples was my "WOW" moment." Great tour guide, great itinerary, great group of travelers. "Touring the cave dwellings of Matera." Awesome tour guide, Caterina! Amazing cities to visit, some of which aren't well known (Vieste, Alberobello, Matera). Sleeping in a cave! Fun activities - making friends with a buffalo at the buffalo mozzarella farm, making homemade pasta and gelato, among others. Great local guides - Gaetano at Pompeii was a favorite of ours on our first Rick Steves trip 15 years ago, and he was equally amazing the second time around. So many new experiences after visiting Italy several times before. "Matera and sleeping in a cave! It was so different than anywhere else I have ever been. A close second was having dinner with the family in Sorrento in their home. They were so nice and welcoming and it provided an experience that we couldn't get in a restaurant. Their granddaughter was delightful." Our tour guide, Caterina, has an infectious love for Italy. She and all our special area guides were knowledgeable and showed us unique viewpoints for viewing and appreciating the treasures of Southern Italy. All our locations were wonderfully situated, the meals were delicious and our tour group was, as usual for a Rick Steve's tour, wonderful. "The "cave" hotel in Matera has an underground thermal spa that is magical! But, there were constant "wow" moments. The dinner in Sorrento with a local family was very special and going into the grottoes on our boat tour in Vieste was an unexpected treat. I am always amazed at how memorable Rick Steve's makes his tours." Outstanding, as always. Our 3rd. Great guide, Caterina. Comfortable bus. Great hotels. Love their locations. Great education. Great people. "Matera. Loved learning about the peoples. Loved the old city and our hotel. loved sitting out on the decks of the hotel, seeing the lights, drinking wine with our new friends. Loved this place, and especially our hotel." This is our 4th RS tour, and we enjoyed it very much! It took us to some places that we probably would have never gone to on our own. Our group meals overall were very good, and the wine was great! And we thought our tour group was the best ever..such a congenial group of folks! "My "wow" moment was when my husband and I spontaneously joined an evening procession to the cathedral in Matera, which was hosting a celebration of the feast day of one of its patron saints. We so enjoyed mingling with the local folks as they walked through the streets. We walked behind a band, with people praying the Hail Mary (I think), and men carrying an elaborate statue of Sant'Eustachio. Later, we were surprised by the fireworks that we were able to see from our hotel veranda." We were awestruck by many of the southern Italy experiences[INVALID]especially Matera and the Amalfi coast. We loved learning about Italian geography and history[INVALID]especially from our guide, Alfio. "While we were aware of the Amalfi coast, we had no idea about Matera: it was truly "awesome" while at the same time very sobering." We had a wonderful time on our tour of southern Italy. The sites we visited were amazing. However, what really made the tour outstanding was our guide, Alfio, and the wonderful group of people we shared out experiences with. "I've always wanted to visit Pompeii, so that was definitely a "wow" moment, but there were also many unexpected moments, such as the view of the Adriatic from our hotel balcony in Vieste, seeing the sculpture of the veiled Christ at the Museo Cappella Sansevero in Naples, and touring the Greek ruins at Paestum." Fabulous. Southern Italy was fantastic- great views, interesting itinerary, great guide, great food and wine, etc. "The Amalfi coastline and the entire town of Positano." This tour was amazing! I had the best time. Outstanding locations, guides, and hotels! "Can't pick just one, loved it all!" "Matera was a revelation since I did not know much about it. All the tours with local guides everywhere were priceless I don't think that going on your own would be so fulfilling, not to mention the preparation that one would have to do to in order to really see and understand what you are looking at ." Outstanding. A wonderful congenial compatible group of people, amazing centrally located hotels, an itinerary that included well known/must see places plus some hidden gems, and good food. Reasonable free time and planned activities at an accommodating pace. "I thought it would be Positano and the Amalfi coast, but it turned out to be Matera. What a wonderful gem and we were so pleased that it was included on the tour." We chose the tour because it included the trip to the Adriatic coast and were not disappointed. Vieste is a charming seaside town less touristed than the Amalfi coast. We were able to get a real experience of the local life. Ancient Matera is in a word, awesome, and a must-see. 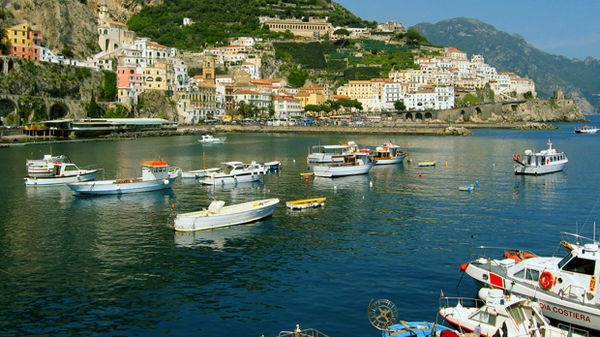 Who wouldn't love the Amalfi coast - especially when warm enough for a swim? And do not forget the museums - the art of the masters and artifacts from antiquity. Top it off with Rome and Napes - perfect vacation. "My "wow" moment was swimming in Sorrento with a view to Mt. Vesuvius. Just walking in the towns and taking it all in - this possible because your hotels are well situated - you just can't believe you are actually there." My fifth R.S. tour. As usual: a great tour leader: namely, Alfio; a mixture of urban, small town, and rural places visited: i.e., not just cities; and a comfortable coach and an excellent driver. A nice mixture of fellow group travelers. I preferred the east coast sites (on the Adriatic Sea) or in the interior to those on the west coast. "Two"wows": Vieste, a town not overwhelming large, and easy to explore; and especially the boat tour of the nearby coast: complete with high cliffs, caverns, and grottoes (some interred), on the southern side of the Gargano peninsula. Also, Matera and the initial surprise, indeed, shock, of first viewing it (the seemingly unnumerable caves) from across the gorge and then discovering the small, modern city itself. A deep lesson of 20th century Italian history." "This is probably the most difficult question. Gail's was looking across the Sassi in Matera at dusk. It was like a glimpse into another time. Mine had to be walking onto the terrace in Capitoline and seeing the Forum laid out before us. I could almost see the old Rome come to life." We are first time Rick Steve's tour travelers and everything related to our South Italy Tour exceeded our highest expectations. Our guide, Lisa, was an absolute pleasure to meet, extremely well organized, and provided unique cultural insight into the many attractions we saw as well as the Italian life style. We especially enjoyed the mix of rural and urban experiences that this tour includes. This coupled with a smaller tour group size provided us with a trip of a lifetime. We loved the Southern Italy tour. Our guide, Lisa, was outstanding, and all of the local guides were as well. Most of the group meals were very good and a lot of fun, and the hotels were also very good, especially those along the coast where we could swim. We had a very compatible group, as we have on all previous trips. We walked a lot, and were often tired, as it was hot and humid most days, but we saw and learned so much. "We loved Pompeii, visiting Matera (the Sassi stone dwellings were amazing), and Sorrento. The Archaeological Museum in Naples with the Pompeii artifacts was incredible. The Buffalo farm was great fun, as were the sorbetto and pasta making demonstrations." 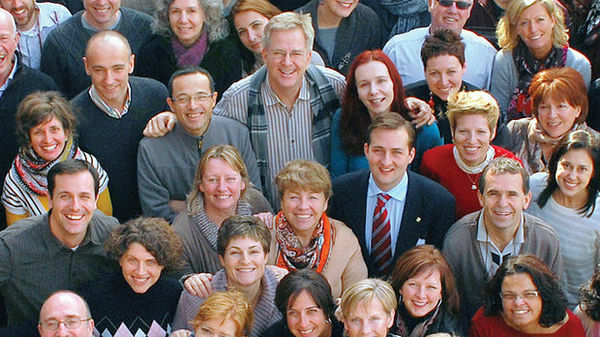 This was the first Rick Steves' tour I had ever been on and I thought it was fabulous! From start to finish all details were well covered. Our guide was friendly, knowledgeable and available. The local guides were also friendly and knowledgeable. The bus was comfortable and we had a very competent and experienced driver. The hotels were well placed, clean and comfortable. In each city/town I felt well equipped to be able to wander around on my own. "It's hard to pick just one. I have a number of highlights from the tour, but I think my biggest "wow" was just "I am in Italy and seeing all of these things and places that I had only read about"! That was, and is, incredible!!" This was a wonderful tour with a lot of variety in terrain. Starting with a fabulous tour of the Capatoline museum in Rome, winding its way through southern Italy and ending with fabulous music, food, art and artifacts in Naples, there is something for everyone! "Looking across the canyon at the city of Matera with its fascinating geology and panoramic view of cave homes." After hearing many previous tour members describe this as one of their favorite tours, we thoroughly agree. We especially enjoyed the opportunities to experience some of the less touristy areas of Italy such as Trastevere in Rome, Vieste, Matera, and Naples. While very active, the tour consisted of a great blend of group activities and time to explore on our own. "We experienced many "wow" moments including an unexpected Carabinieri concert in the piazza next to our hotel in Matera, lunch and wandering the Old Spanish Quarter in Naples, and the boat ride along the coast at Vieste." While I have traveled quite a bit in Europe and even lived there for almost 5 years (Germany), I had never before been on an organized tour. My wife convinced me this would be a less stressful way to visit a lot of places without the hassle of driving and itinerary planning. Overall, I was impressed with the quality of our guide Lisa, the itinerary, and our local guides. The size of the group (almost 30) made it a bit unwieldy at times but that is my only critique. "My single favorite event was the evening meal with Luigi and Teresa at their home. I got to ride there in the front seat of the van and got a "driver's view" of the chaos that is driving in Italy. Mamma mia! We had a wonderful dinner and had so much fun bonding with Luigi and his American daughter-in-law and her small children. The food, wine, conversation, and people were fantastic. Truly, a night to remember." It was welled paced. Lots of incredible tours and enough down time to explore on your own. It was exactly the kind of tour we were looking for. It met all of our expectations. The group meals were delicious and interesting. The hotels were fun and comfortable. Nina was upbeat and very informative. Our days were paced in a manner that allowed for many breaks but did not allow for boredom. We were well prepared for days activities and updated when changes had to be made. "Two moments To see the old roman city from the Capitoline Matera"
The places we visited held so much history, art, and architecture that was both interesting to see and hear about from the guides. Certainly the museums and archeological sites including Adrian's Villa and Pompeii were exciting to see, but could have had more time at the Villa. The home meal was delightful since most of the hosts spoke English; otherwise this can be trying for both guests and hosts. The buffalo farm and luncheon show Italy's attempt to keep natural foods. "The Materna experience of viewing the city from the gorge and the tour of each section were fascinating for its amazing story of man's early years through more recent days. It would have been great to have seen more rock churches, especially the one outside of town. The Archeological Museum is well done and provides additional information about the area in Paleolithic/Neolithic times. It also was wonderful to have a cave hotel in which to stay." The 13 days went by too fast. We enjoyed every minute. "MATERA!!! T can't stop talking about Matera!!" Overall the tour was very good in terms of the sights seen and the narrative provided by our guide. While some of the days of the tour on the itinerary noted "strenuous" walking, we were not prepared for the fast pace of the walking with our tour guide. Walking consisted of uneven cobble stone streets and many steps up and down hills at a very fast pace. The fast pace was not necessary as time restraints were not an issue. Or if time was an issue, the itinerary should have been adjusted. "I think Positano was my favorite place because of the beautiful ocean views, the shops and restaurants. Matera was breathtaking in its unique beauty due to the cave dwellings and their placement on a bluff. I loved seeing the buffalo farm!" It was a great tour. I wish we could do it again. "I think Matera was a WOW, because it was so different." I loved this fabulous tour!! Nina was an amazing and very knowledgeable guide, as were all the other guides. The combination of activity and free time was perfect!! The hotels and meals were great! "There were so many "wow" moments. From the boat tour of the grottos in Vieste, to unbelievable Matera, to the incredible sea views from our balcony in Positano along the Amalfi Coast. Loved shopping in Sorrento!! However, the "WOW" moment for me was Pomeii. Our guide was just the BEST! His knowledge and passion brought the tour home for me!!" The Best of South Italy tour was wonderful, exciting and educational. It was well organized with a few surprises here and there which made the tour extra fun. Some parts were quite vigorous and strenuous. However we knew this before we signed up because it was well described in the Rick Steves' tour book. "My favorite "wow" moment was our boat ride off the coast of the Gargano Peninsula in the Adriatic Sea. It was breathtakingly beautiful and so exciting when we entered the caves. A close second was our tour of Pompeii." This tour was beyond expectations. Our tour guide Nina was outstanding. In fact, all of the guides for the tour were. The balance of tour to free time was great. Only wish we could have spent one more day in Positano so I could have enjoyed the hike in Amalfi. "Pompeii. The tour guide was exceptional. He truly brought the town to life for me." This was my first tour, first visit to Europe so I didn't know what to expect but it was such a fabulous trip. We went places even my seasoned friends had never been. Nina was a great tour guide giving us historical background and the local tour guides were also great and informative. The dinners were delicious, even the "fast" foods were good. "I took the tour because Pompeii was my dream but being in Naples was an experience. I've been to New York several times but the traffic in Naples was a thousand times worse, you risk your life crossing the street but I liked it. I would go back. I flew home out of Rome and after experiencing Naples, Rome was a quiet village." This was the perfect tour for me. Loved the locations especially along the coast lines. Loved the knowledge gained to see ruins in a whole new light. Spending time in Naples provided me a glimpse of what I think is true Italian life. It may be gritty, but loved spending time there. People in our group were really great and enjoyed their company throughout the tour. The size of the tour group is nice for getting around, going to good restaurants together, easy to follow the guide. "Matera was my WOW moment. From seeing it at the view point across the river to walking thru the 'new' city and then looking down on the 'old' city. WOW. To going for the passeggiato with the locals. So sweet to see the older women linked arms with a daughter, to the teenagers strutting their stuff, to the families out and about. Brought joy to my day." Really enjoyed the South Italy tour. Food and wine were great. Beautiful vistas throughout the trip. The mix of guided tours and free time was good. Hotels located in great areas of the cities and towns we visited. Our tour guide, Nina was great and very knowledgeable. Most of our local tour guides were very good as well. I liked most of the selected tours and museums. The Hadrian ruins was on the bottom of the list,only because there was so little of the structures left. "There were many wow moments on this trip. I really liked the boat ride we took from Vieste along the Adriatic Sea coast and stopping to enter a numbers caves along the way." Excellent local guides enhanced the tour. Hadrian's Villa was a pleasant surprise- much better preserved than expected. Vieste & Matera were both highlights not to be missed. The ferry from Positano to Amalfi is packed with viewing highlights. Pompeii came into better focus after our visit to the Archeological Museum. "The dinner with Teresa & Luigi in Sorrento. His limoncello is great." An amazing experience in so many aspects!-- We wanted to see a part of Italy we had not seen before and also revisit past favorites!- Caterina and the local guides all excellent and made history come to life and be relevant to the present. I am amazed by how much we learned and how much more I want to know! "The awe at seeing Matera for the first time from an overview-- and the sustained awe of actually staying there--rates among my top experiences ever. The sheer joy of the boatride in Vieste-- along the beautiful beautiful coastline and the utter surprise of going inside the caves- Experiencing a museum tour like no other with Francesca- will never look at statues the same way!" We enjoyed all of the tour stops: a great combination of unique (eg, Matera), beautiful, historic, and fun. The special experiences such as the water buffalo farm and the pasta making demonstration were memorable and informative. All of the accommodations were very good. The local guides were both knowledgeable and very personable. The tour was well organized, and our guide kept on top of things and handled problems that did crop up with skill and calmness. "Hard to pick one out, but the first view of Matera from the overlook across the valley rates very high. It was amazing to grasp the scope of this site both physically and historically." Well organized, seamless travel. Caterina was a knowledgeable, enthusiastic guide who was excited to share her love of this country. Her outgoing personality has enabled her to meet many locals and we benefitted from those connections. She used much forethought during the trip to ensure that we were safe, secure and happy. The country was spectacular. The history was interesting. The weather was gorgeous. "I had an unexpectedly emotional response to the tour of the Capitoline museum by the guide Francesca. I was so moved by the connections she was able to describe between those ancient peoples, their lives and family connections that I began to cry. And her words came back to me throughout the tour." I expected a wonderful trip, but this was special. Having lived in Southern Italy, it was great to see how modern it has become. This was our third Rick Steve's tour and the best so far. Caterina was so knowledgeable and fun, and our group really connected. "Two favorites: 1. Taking a Taxi from Matera to San Vito where we lived in 1974. 2. Vieste and the boat trip. This area was new to us, and certainly would recommend it for a visit. Beaches, water cruises and lovely strolls in the evening." Full of "wow" moments everyday with comprehensive information on Southern Italy: history, culture, political, and social. Our guide Caterina was an incredible fount of wisdom, and supplemented by excellent guides in Rome and Naples as well as at several stops along the way. But also understood the need to places things in context as well as giving us time to "absorb" all that we were seeing. Tour was well paced with time for us to explore on our own and take advantage of our locations. "Personal; it was our opportunity to visit the town where my wife and I lived from 1973 to 74 while stationed in the US Air Force and visit the street and place where we lived. The Archeological Museum in Naples and Pompeii were also one of the highlights." Traveling to both tourist and non-tourist cities, allowed us to see the true culture of Italy. There is so much more than meets the eye. This tour brought us up close to the agriculture region of Italy. Allowing us to see different sub-cultures within Italy. There is so much more to see and experience and this tour just wet our appetite. "The visit to Matera was beyond belief. To actually see and walk through this ancient city was surreal. It was like stepping out of a time machine thousands of years in the past. I will never forget the experience." One of the best travel experiences I've ever had!! The guide was fantastic, transportation was comfortable, all the accomodations were wonderful and the city guides were extremely knowledgeable!! It had been 15 years since our last Rick Steve's trip so we were a little curious if the "feel" was still the same......It exceeded all our expectations!! I can't thank our guide, Caterina, enough for making it a truly fantastic experience. "Two of them: The jet boat ride along the coast (and thru the grotto's) outside Vieste and our city guide in Rome, Francesca. It was very evident she was passionate about the city of Rome. She had us all intrigued for the entire time we spent with her!!" This was great tour in that we got to see the Adriatic side of Italy which we had not experienced in our previous trips. And there was much to see there including the beautiful white cliffs along the sea, the cave houses of Matera, and the conical roofs of the trulli. We also had a chance to revisit wonderful places such as Positano and Pompeii. I would highly recommend this tour to others who would likely believe in the Rick Steves philosophy of travel. "I had two "wow" moments: Vieste was just a wonderful place. We had the opportunity to take the boat ride along the gorgeous coast and enter the caves. A part of the trip I will always remember. Also, Matera was incredible. The long, rich history, the fascinating cave houses (and hotel)." We enjoyed visiting parts of Italy that we had never been to before. It was a good mix of large cities (Rome and Naples) and "backdoor" locations such as Vieste and Matera. Our convivial group was led by a knowledgeable guide and an expert bus driver. "Of the many "wow" moments, I will remember the panorama as we approached Matera. To think that people lived in cave homes until the mid-20th century was mind boggling. Other highlights were the Vieste boat ride and the opportunity to take a sneak peek at a ballet dress rehearsal at the Naples opera house." This tour seemed to be the most strenuous of the 12 I've taken but loved most all the sights we saw. Have been wanting to see more of S. Italy for a long time and this didn't disappoint. The one thing I was really looking forward to was seeing the trulli houses. Was probably a little disappointed in the fact that the area we went to was soooo commercialized. I was thinking it would be a quieter town setting. The water buffalo farm was not my favorite cheese experience. "Many favorite moments from the storytelling of Francesca to the grottos of Vieste to the caves of Matera to the views of Positano...But one of my favorite days was when a friend and I skipped the Archeological museum of Naples (which I had been to before) to ferry over to Procida. Ah, what a beautiful day and peaceful island. The locals compare it to Capri in the 1950's....."
This was my 17th tour. I have not been disappointed. Years ago I went on the south Italy and Sicily tour. I don't usually repeat but I wanted to see the east coast spots which were wonderful. Good balance of group activities and free time. Lots of opportunities to do things on our own. Enjoyed all the beach time I carved out. "So many as usual! It was very fun going in the caves on the cruise from Vieste down the coast, and the coastline was beautiful. Thoroughly enjoyed the spa at the hotel in Matera. Really enjoyed going in the subway station in Naples to see the mosaic art and the celestial feature. It was also wonderful to get to see the ballet rehearsal at the opera house." I thoroughly enjoyed the tour of Southern Italy. There were a variety of activities planned for us that kept each day interesting and learning new things. I'm not much of a sitting type of person, so the activity level of this trip appealed to me. "Its really hard to pick my one favorite moment from the tour.. top of my list would probably be Pompeii, then the sassi dwellings in Matera. As an add-on, we did the subterranean tour under Naples..that was very impressive. Be sure to keep mentioning that as an option for people on their own time..it was a very interesting respite from the top-side heat of the end of summer." First trip to Europe and I will never forget it. Very good value for the tour cost. And the efficiency of participating in such a tour is inestimable. No time lost trying to figure out routes, where to stay, where to eat half the time, etc. And Tommaso's 'quickie' tours of each town/city we visited helped tour members maximize free time to best advantage. Also, Rick's tour books were invaluable. "Sorry! For this first time European traveler, nearly every moment of every day was a 'WOW!' moment for me." So glad I decided to do this trip. It was a wonderful experience so worth the time and money. "Francesca's tour of the Capitoline was amazing, especially her urging us to think of the stones, frescoes, and sculptures as something alive with something to tell us in the present." We had an amazing tour- we saw so much, experienced more than we have even be able to process to this point (LOL) and got to see both the Adriatic and Mediterranean! "Everyday brought a "wow" moment- but the homecooked dinner in Therese's home in Naples with her family was an amazing time." Jam packed with history and art. I loved it! From guides, to sites, to itinerary--it was super. "I guess either the Capitoline Museum and Jewish Ghetto in Rome with Francesca...or visiting Pompeii with our outstanding local guide, a third-generation Pompeii guide. Very insightful and fascinating days." Hi Rick and staff. This was our 4th RS tour, and we were certainly not disappointed in the slightest. It was great and ranks at the top along with our Spain tour. You were right about it being strenuous and active, but we persevered, even with my sore knee. There was so much packed in there, but we appreciate seeing and doing so much we would never be able to on our own. "As usual, that's a tough one. I think I would have to choose the home-hosted meal with Theresa and her family. Almost as soon as we sat down, there was course after amazing course, so many that I lost count, mostly incredible vegetables. I would have to say it was one of the most impressive and enjoyable meals of my life. I hope you will tell her I said that, too. It felt very friendly there for sure, and the wine was also good and very plentiful." I enjoy being active and engaging. Tommaso is a valuable asset to your team. In my opinion he serves not only as critical example of you and your organization but ombudsman for Italy. "While Florence will remain my favorite location in Italy, Materra was a surprising gem. Pompeii and Herculaneum are both must see. I could have stayed 2 days in Pompeii alone." Very happy with our guide, Tomasso! He gave us so much information, was enjoyable and made us feel so comforable! Our bus and driver were so good, as well. Our local guides gave us such a wonderful understanding of each museum experience. "My favorite was touring Pompeii and then following that with Capodimonte Museum! Both local guides helped me really understand the civilization in Pompeii." I enjoyed the two weeks. The group got along very well together, and Susanna was an excellent guide. "What I remember most fondly was Matera. So unique. I felt that we had enough time there to really get a sense of the place." "Hard to choose Matera and our cave room - most interesting Amalfi coast - most beautiful"
I was very happy with the tour. I saw things that I know I would not have if I planned the trip on my own. I liked the pace that we kept. I also like the way our guide helped us to get to know each other better. "I think the caves in Matera. That was an amazing story and experience. Something I didn't know existed." Susanna was absolutely fabulous. Organized, inspiring, motivating, entertaining...I could go on. I fell in love with southern italy and am craving more time there. Thank you for introducing me to such a special part of the world. "The veiled Christ in Naples. And our guide, Pena's passion. Paralleled with Francesca's passion in Rome and her thoughts on the ancient art of italy." My husband and I had a wonderful time on the Southern Italy trip. We enjoyed the group and the variety of sights we were able to see. "I think one of my most memorable "wow" moments came in Naples at the visit to the Cappella Sanservero, where we saw "the Veiled Christ"." We loved everything about this tour of Southern Italy. "The tour of Pompeii. The tour guide was outstanding." Once again when I am looking for a tour to take , I look for the little extras, especially as related to food. This tour did not disappoint. The gelato demonstration, the water buffalo farm and luncheon, the pasta demonstration, and the "family" dinner were some of the best highlights of this trip. "3 museums - The Capitoline, the Palazzo Reale Capodimonte Capella SanSevero. So much beauty and knowledge packed in, that you only realize with a great guide." It was wonderful trip - our first to Europe and we could not have asked for a better introduction to Europe and especially Italy. "There were so many WOW moments. Pompeii was fabulous and the Archaeological Museum in Naples was also fabulous. We were also amazed at the Veiled Christ in the Museum Cappella Sansevero. But also seeing the Amalfi Coast was breathtaking - so basically the trip was full of WOW moments almost every day!" everything was as advertised . we had days full of museums and history. we had partial days where we could explore areas that held our own interests. the food and wines were awesome . Ann, our guide kept us moving along in order to see and do everything on the schedule and with a sense of humor. "just too may "wows". everyday was my favorite ." This was our 4th RS Tour. Our tour guide Ann was outstanding and very knowledgeable about Italy... she could answer any question presented to her. She was also very kind to help us with the correct Italian phrase when we needed it. "Cappella Sansevero Chapel in Naples- breathtaking for sure. Also the dinner in Sorrento with a local family.. and I can't forget enjoying an occasional Aperol Spritz !!!" Enjoyed visiting the small towns on the tour. Could do without going to Rome and Naples (except Freemasons church). Positano was lovely also family dinner. Capri overdeveloped and crowded. Ann did a great job as tour director. "Positano and boat trips set up by Ann." We had a great time. The tour was informative. Our guide, Ann was absolutely wonderful. All the hotels were nice with the exception of the last one, which I think was a hotel normally not used. The last hotel did not replenish essential items including toilet paper. "This was such an amazing trip that it is hard to choose just one moment. If I have to choose I'd say the dinner with a local Sorrento family. Wonderful food, great company, and good wine. Our hostess went out of her way to provide vegan options for me." really enjoyed the many museums and sites that were part of our tour. Great group of people to travel with and experience this amazing part of Italy. Highly recommend this trip. This was are second RS tour and hope to have many more. "The bus ride on the Amalfi coast with the incredible views on this super narrow road. Very exciting. Also the blue grotto,and the view from the top of the island of Capri, The cave rooms in our hotel in matera. Boat rides along amalfi coast and from Viest. Pompeii it just goes on and on. each day was a new "wow" moment!" Another great RS tour, first was the 21 days of Europe, this one was the 13 days of southern Italy. Arrived a couple days early in Rome, so much to see and do. Great group & guide Ann was in her element. Wanted to see southern Italy after the first trip & glad we did, very memorable & enjoyable experience. "Vieste was unique, the Trulli houses were neat to see, sleeping in the Sassi cave room was very cool, enjoyed the water buffalo estate & farm tour, the food was great! The Amalfi Coast, Sorrento, Positano, Ravello, Capri, all stunning, brought back memories of the Cinque Terre. Naples CHAOS, Oh My the PIZZA! The Farnese Bull was stunning & the 300 KMH train ride from Naples to Rome was cool. Other than all the great food & wine, you just can't pick out a single "WOW" moment on a RS tour!" "The group had dinner in the home of Teresa and Luigi--a real feast of traditional home-cooked food. It was wonderful to see how they live and taste all of the things they have to eat at home (I'm sure not all at once, like they fixed for us). Great people, family interactions and house." Our guide Nina was amazing: knowledgeable, friendly, helpful and fun! This was our fourth Rick Steve's Tour and they keep getting better! Italy was beautiful, our guide Nina was outstanding and our fellow travelers were really fun. "I have always wanted to tour Pompeii ever since I learned about it as a boy. Pompeii surpassed my expectations. Our on site guide was great. As a follow-up to Pompeii, seeing the actual treasures of Pompeii in the Naples museum was truly special." Fantastic hotel choices, learned more about Italy's history than my entire educational experience, and food was something to look forward to each meal! "I had a memorable time at the buffalo farm. The information and process of making buffalo mozzarella was interesting and unique. Our light lunch there was the best meal of the trip." Just an amazing trip. Everything went like clockwork. Our tour group leader, Nina, was outstanding. She is so knowledgeable and fun to be with. There was a perfect balance of group and free time. The group dinners were so much fun and the food was delicious. I especially liked the dinner with the Italian family in their home. This was our first Rick Steve's tour but I don't see us ever going it alone again. We just learned so much more and enjoyed our tour mates company. Thank you Nina. "That is an impossible question. Walking the streets of Rome for the first time? Vieste? The Trullis? Maybe that first view of Matera? Sitting seaside In Positano at sunset? Exploring Capri? Pompeii? Taking our lives in our own hands and exploring Naples. Every day was a wow." The amount of places (cities, museums, archeological sites) we visited in 13 days was amazing. Towards the end of the tour my interest in the museums started to wane. It was nice to have afternoons and some days on our own to explore the city or rest in the cool hotel room. Overall tour experience..amazing! "After several hours on the bus we arrived at Locanda di san Martino in the evening. Too impatient to wait for the elevator, I hauled my suitcase up several flights of stairs to get to Room 15. "Wow, this must be the honeymoon cave!" It had a curtained bed, jacuzzi jet tub, LED lit walk-in shower, sofa and CNN International. It seemed like the highest cave in the hotel and the patio sported a panoramic view of historic Matera." It was excellent! This was our 3rd tour with you and each exceeds our expations! Nina was a excellent guide with lots of wisdom and whit. We had a fun group of people that enjoyed traveling, learning about their soundings and drinking a little wine. The group meals were excellent and our hotel acomadations were wonderful. We are already waiting for the 2019 RS tour book to come out! "That is hard on this trip because we had so much history, art and beauty every day! But, the caves in Matera made the biggest impression on me. Going in the cave where people lived until the 1950's and 1960's (my life time!) and their horrible conditions, I will never forget. This is something I never would have done on my own, but thanks to the RS tour, an unforgettable experience!" Our southern Italy tour was even better than anticipated with our fabulous tour guide, Andrea. Knew I would love seeing the Amalfi coast which was my motivation for choosing this tour. However, I greatly enjoyed Matera, Paestum, Vieste, wine tasting/food pairing in a trulli in Alberobello, Pompeii, archeological museum in Naples & Neopolitan concert in Naples suggested & attended by Andrea & several RS travel companions. Traveled with a great group of motivated & fun-loving travelers from US. "I have many "wow" moments which I've narrowed down to 3. Our stay in Positano (great views, food, wine, limoncello, shopping and swimming), Loved our day-long boat trip to Capri with Pasquale of "My Sorrento Holiday" along with some fun Rick Steves' travel mates. Lastly, the Veiled Christ and Disinchantment sculptures[INVALID]can't understand why Guiseppe Sanmartino and Franchesco Queirolo are not as famous as Michaelangelo, Da Vinci, etc because I'd never viewed any sculptures like that!" From start to finish, I felt every aspect of the Southern Italy tour was well planned and executed. The abundance of food and local wine, the interaction with families in Sorrento and Naples, the pasta making demo, wine tasting, boat trip, the museums, the impromptu music discovered in almost every town, the historic and breathtaking scenery. Loved it all. "My first wow moment came when touring Rome. When our guide said she was going to show us the most spectacular view in Rome, it was not an exaggeration. I actually got goose bumps! My second wow moment was when we arrived at Matera. The view overlooking Matera is truly amazing and like nothing I've seen before. Many great moments throughout the trip." Best of South Italy was a wonderful trip. We have been to Italy and the Amalfi Coast before, but this covered several things and places we have not done before (Capitoline Museum in Rome, Jewish Quarter in Rome), Vieste and Matera. We have visited the Amalfi Coast and Paestum, but going with a group enabled us to do some things we have not done before. "Eating Pizza in Naples at "The Temple of Pizza" (L'Antica Pizzaria da Michele). We did this on our own after the Archeological Museum in Naples. We did not get to eat there the first time we visited Naples in 2003 and this was definitely on our bucket list! Do not miss this if you go to Naples - worth the wait and a wonderful experience! Plus many others: walking inside the temples at Paestum; eating the fresh buffalo mozzarella lunch; Amalfi Coast (everything there); Vieste; Matera & on & on." I had a wonderful time in Italy. I was comfortable with the entire experience. No complaints what so ever. "Veste hotel best room with a deck over looking the Adriactic Sea. Early morning saw 2 fishermen out in small boat bringing in their nets.No One else in the town awake yet Families waking up early morning hanging out laundry 3 stories up. Kids diving off rocks in the beach below! Power outage shop keepers helping each other happy tourist in alley during power outage.OBTW our hotel had a generator and the best crosissants and breakfeast beautiful property proud owner and family!heart warming"
While we've traveled independently before, this was our first group tour. You planned it so well for us that we want to do it again! It was great fun meeting new people who had common interests and goals, and who loved exploring and learning. We were a diverse group, but we all could enjoy each other's company; have camaraderie, many laughs and share special memories. "It's so hard to pick just one! The boat rides into sea caves out of Vieste, and the views from the boats on the Amalfi coast were especially spectacular! The Positano skyline was breath-taking and staying in a "cave room" in Matera was wonderfully unique." Really enjoyed the tour overall. I knew it would have many features that were unfamiliar to me (even having visited Italy twice before). It was a very satisfying blend of ancient and modern culture, the monumental and the personal. Gave a glimpse into the life of everyday Italians while appreciating the splendor and natural beauty of Southern Italy and the Mediterranean coast. "Every day had great "wow" moments, but I think my favorite was Hadrian's Villa at Tivoli. It was a complete surprise to me and was magnificent. The scope of it and the history and the preserved architecture and sculptures were awesome. Of course, tomorrow I may reminisce most fondly about another one." The perfect mix of Italy hot spots and off the beaten path destinations! Such a great complement to the Venice, Florence, Rome tour I did in 2018. Lisa our guide was incredibly helpful, insightful and kind. Spending two nights in each place was perfect, though we definitely found some places we want to return to and spend more time in the future! Italy is calling us back for more! "Maters was amazing and something I never would have expected to experience in Italy! I loved that this was so off the radar it wasn't even included in rick's book!" This trip was absolutely incredible! I filled all my senses, mind, and appetite. This trip truly made history come alive giving me a clear vision of what I read in textbooks as a child. Not only was it educational but gave me a taste of the beautiful life and culture of Southern Italy. "Adrian's Villa and the city of Matera,"
Overall we enjoyed our 2nd RS tour. Lisa was great, repeating instructions often for us. Good orientations in each town. She was very knowledgeable, I loved the talks about Italy's economics, politics, current and past culture and language. She was well organized and everything went smoothly. She had a great attitude, was very friendly and obviously loves her job. "Pompeii was amazing, also amazing was the archelogical museum in Naples, which filled in some of what I wondered about while walking around Pompeii." our first RS tour was great and even better than we hoped for. We liked the level of activity and the pace and our ability to explore on our own. We were challenged to experience the culture and blend in with the locals. we had great guides and good camaraderie. "I thought Matera was the most impressive city we visited. we knew nothing about it until we arrived and found as an ancient collection of caves, layered dwellings up the cliffs and a maze of streets. It truly felt like we were stopping back in time." We enjoyed the balance between planned activities and free time to explore on our own. The other tour members were friendly and we enjoyed getting to know them. Our guide, Lisa, was very informed, personable & organized. We also appreciated the inclusion of tips in our initial fee package. Thanks to our guide, the quality of the tour & the comaraderie of the group, we look forward to booking future Rick Steves tours. "Our hotel room in Matera was one that stands out." Many attractions were covered in a relatively short period of time. The bus was comfortable and the driver was excellent. "the tour to the Jewish Ghetto and Trivoli." I think the tour is expensive given that most of the attractions would be on any tour, or with independent travel; the number of meals included, and the amount of free time. The main 'plus' that you would not find on another tour or through independent travel, is the guide (Lisa) and the special things she organized. To call it a 13-day tour when it starts at 4 pm on the first day and ends after breakfast on the last day is a bit misleading. "When I pointed out that there had been no cultural or music as of yet, Lisa (guide) arranged for a concert of Italian folk music. This was a highlight as was the tour of the Jewish Ghetto." The tour starts in Rome and ends in Naples and covers points in between from the Adriatic to the Mediterranean. We saw various cities and towns and sampled regional foods and sights. It's what I love about the tours. It's more than I could manage on my own. My fellow travelers were congenial and energetic and our guide, Lisa, could not have been better. I enjoyed her explanations of Italian life during the bus rides. "I was unaware of Matera and it was fabulous. The stone houses and caves spreading up the steep hillside were breathtaking. The hotel room in a cave was beautiful and not like any hotel I've been to before." Lisa is an excellent guide: knowledgeable, organized, patient, calm, and with a great sense of humor. Tour was great. Almost all accomadations were first rate. Guide made the trip much more rich and informative. Friendly and open group of tour members. "The drive from Rome to Vieste. Amazing country side. Small villages backed y castles or keeps. Not something you would ever see in US." It was terrific from Rome to Naples. Caterina was a smooth and flexible guide who was able to improvise when necessary and keep us focused. Francesca was awesome, as was our guide at Pompeii, and the two in Naples. Massimo was a great driver on the windy roads, never skipped a beat. Aberobella, Matera( really liked that place)and the Amalphi Coast was awesome! Naples was simply the best, really like it quite a bit. "Hard to pin down ONE wow moment. Pompeii and Paestum were awesome sites! The boat ride in Vieste was truly unique and Matera was like nothing I have ever experienced. I very much liked the choice of museums both in Rome and Naples and the long street tour with a guide, who was excellent, in Naples. The constant windy roads and experience of being in old narrow streets was very cool! But I loved experiencing the Veiled Christ in Naples." This tour far exceeded my expectations. And it started in Rome with local guide Francesca. What she shared with us about her country's layers of civilization stayed with me through every city, town, museum.... we visited, enriching beyond measure my experience. Thank you, Francesca!! "The private dinner in the home of a family outside of Naples.... such a welcoming family, such delicious food, live mandolin music and dancing!" We loved the all of the tour stops, especially Vieste and Matera. The boat trip was spectacular and the cave hotel was very enchanting. Katarina was a very knowledgeable and gracious leader. "My "wow" moment was the family dinner in Sorrento. What a great opportunity to enjoy the culture." The trip was better than I could have ever imagined. Transportation, guidance, accommodations were all outstanding. We only had one time where we had trouble getting to a place we were going to eat but our guide made other plans that were more than adequate. "It's difficult to choose a favorite moment because there were so many but the cathedral where The Veiled Christ was a highlight for me. There was such a wonderful variety of things to see and do throughout the tour." I enjoyed this tour immensely. Caterina used the tour to tell the historical story through the places and sites we saw. It was a lot of fun! The food was excellent as were all of the group experiences... especially the group dinner in Sorrento. "My favorite wow was Matera. It was fascinating and beautiful. Staying at a cave hotel really enhanced the experience too." "The veil of christ chapel. Totally unbelievable on how intricate and detailed the sculpture was." What a phenomenal trip! Caterina and our local tour guides were fantastic. The food and drink were incredible. The scenery, historic locations and art were stunning. The tour was well organized and had a great flow to it (a perfect mix of scheduled and free time). I especially enjoyed learning about and supporting local businesses (restaurants, hotels, various artists) throughout the tour. "Vieste was lovely! We stayed at a family-run hotel with great accommodations and excellent restaurant. The area had beautiful scenery and our group enjoyed a boat tour along the coast." It was everything we were hoping for! Our trip leader and all the local guides were wonderful. Our bus driver Massimo had a velvet touch on some really difficult roads. The places we visited were amazing, the accommodations great, the food fresh and abundant. We never could have planned a trip like this on our own. I really appreciated the thought that went into it, aiming to satisfy many kinds of interests. We also appreciated the friendly and adventuring spirits of our fellow tour mates. "There were so many! Matera and Vieste were both unlike anything I have ever seen and so interesting. Loved all the archaeological sites we visited. The family dinner in Sorrento was really special. I'll never forget the tour of the Capitoline Museum with our guide Francesca, and the view over the Forum from it." "Overlooking Matera at night and staying in the cave"
The overall tour experience was excellent. The tour had a very even pace, nothing to overbearing. I loved the story ithe tour told and the personal touches like the home we had dinner in Sorrento. "My WOW moment was the town of Matera. I loved the town and it's history which wasn't very old. I was also surprised with how much I enjoyed Naples. The town doesn't get much publicity living in the shadows of Rome, Florence and Venice. The Veiled Christ at Cappella Sansevero in Naples was another WOW moment." I enjoyed the different locations, and feel that some of our stops were to short to enjoy the history and charm of the cities. The charter bus on this tour seamed tobe substandard compared to our bus on our tour in 2016. "The boat excursion around the cliffs in Vieste and the entering of the various grottos." Our first group meeting, the room was not big enough to accommodate 28 people so we were in two areas stretching our necks to see one another. We made it work but all in one room would have been more effective. The bus was cramped, seats very narrow, unlike on my last RS tour. Finally I chose to not sit with my husband to have more room It needs an extra 2 days. By Positano, we were all tired. Arriving in the evening really only gave us one day there. Positano and Sorrento needed an extra day. "Lots of Wow moments - The Veiled Christ, Vieste boat ride, Pompeii. Santa Chiara wasn't on the tour, but it should be. Post-tour we visited and it was definitely a wow!" Great sights, fellow participants, weather, food... couldn't have asked for more other than to have done more homework up front. "It is hard to pick one moment although the boat trip (personal option choice) around Capri was beautiful." My husband and I were delighted beyond our wildest expectations on our Best of South Italy tour! This was his first European trip and my second, so we were new to the international traveling scene. This tour was so well organized and our days were smooth and filled with incredible information, sights and experiences. We are recommending this to all our friends and hope to experience another one in the future! "My favorites were The Pantheon, Matera, Pompei and Sorrento. The history and beauty touched my heart." This was our seventh Rick Steves tour and we're already trying to decide which one to do next. As always, the outstanding qualities of the tour guide and the local guides put the tour over the top. We had been to a few of the sites on our own in previous trips to Italy but got so much more out of them from the insights provided by Susanna and by the local guides. And the inclusion of Vieste and Matera on the tour was brilliant. "Matera wins the prize for me. Though I'd read about it, seeing it in person -- especially with a guide who grew up there -- and staying two nights in a luxuriously converted cave was an unbelievable experience." Wonderful experience-amazing tour guide (Patricia) and excellent local guides-great hotels and delicious Italian food and wines-relay loved seeing Matera, Pompeii and Herculaneum-and Naples was a positive experience as well. Great tour mates and positive energy the entire tour made the trip outstanding! "Matera was a wow-would have liked to have had an extra day there-such an amazing city-such history and beauty-truly magical. Also loved visiting Pompeii-had been on my bucket list for years and did not disappoint!" The lodging was outstanding.The meal at the home of Luigi and Teresa was fabulous. The museums and guides were excellent and very educational.For me the education was excellent, that is why I travel, to learn! The culture of the south is so different from the north of Italy. The history of the Jews in Italy during the second world was was profound as was the plight of the Sassi people of Matera!! "Pompei !! The exposure provided to view the Italian artists and sculptors with excellent guides was exceptional. The opportunities provided to us to understand the culture of southern Italy was beyond my expectations." Wonderful tour with great people. Lots of laughs and scenic sites along the way.Not to mention the art and history of southern Italy!! WOW! "The roads to Vieste and Positano. WOW! Kudos to the bus driver Maximo master of the hairpin turns!!!" This was my fifth tour, second in Italy. I have become used to "extras" on these tours, but this one took that to a new level - especially the private boat trip from Positano to Amalfi town. There were also lunches and "aperitivos" that I was not expecting. The flip side, the distances between overnight stays was often greater than I had expected. My personal preference would be to have arrived at our overnight destinations earlier. "The art work, in particular the sculptures - some not included in the tour such as the Borghese gallery in Rome. But even small cities such as Matera had amazing art museums. Naples, while chaotic in many ways, has art work to match the best of any city in Europe." Southern Italy-there was so much to see . . . the Colosseum and Forum were amazing. Vieste was beautiful & I loved the boat ride along the Gargano Coast. The view from our hotel room was spectacular. The Sassi area of Matera was incredible. Positano, Almafi, Sorrento, Capri and Anacapri were so pretty to walk through and I loved seeing the coastline from the boat rides. Even crowded Naples was a great experience. The pastries at Gambrinus were delicious and Gelato was a must every day!!! "My favorite "wow" moment was learning that Matera was once considered the shame of Italy and in 2019 will be named the European Capital of Culture. It is so rich in history and I am so happy that I was able to visit such an area. I loved that we stayed in a cave hotel, and the night strolls with all the locals were amazing. Everyone from 4 to 84 was out walking, enjoying the pizza and gelato. Dinner at Luigi and Theresa's home was incredible and very memorable. It was absolutely delicious!!!" The overall experience was fantastic. I love the diversity of locations and activities. Each day and each activity was a very enjoyable, worthwhile experience. I feel that I learned so much about the culture and history of Southern Italy. "That is really tough to choose. I think it would be seeing the 'Veiled Christ". Thank you for including that stop; if I were traveling on my own, I might not have seen it, and it is a life-changer for me." We were blessed with a great group, excellent weather and a terrific guide. It was nice to start in Rome, exploring neighborhoods new to me, and then to move to the beautiful Adriatic coast after the bustle of the city. There were a wide variety of locales, both historic and scenic, bucolic to slightly crazy. (Napoli). I felt it was an excellent introduction to the different regions of southern Italy. For me, an early arrival and one long day in Naples might have been enough. "I think Vieste. It was like a picture postcard, with stunning views, turquoise water and a charming hotel. The boat ride along the coast and thru the various small grottos that dot the coastline was gorgeous. The views of the Bay of Naples and the Amalfi coast were stunning as well and of course Pompeii was mind boggling." This was our 5th Rick Steves tour and even though even it was an extremely good tour some of the place visited were a little disappointing. The crowds, traffic, and noise in Positano and the Amalfi coast were unpleasant. Of course, Naples was gritty and dirty but expected. I just found the places visited were not as enjoyable as previous tours but all aspects of the tour itself, our guide (Patrica), hotels, tranportation, etc, were outstanding. "I didn't have a real WOW moment but our boat ride in Vieste and the views from Capri were outstanding." Right from the first group dinner in Rome, I knew this was going to be an amazing experience. Our guide Patricia's fabulous personality and sense of humour made me feel very welcomed. Our bus drivers and museum guides where exceptional. Pictures cannot capture the breathtaking views or beautiful artifacts we saw. I really enjoyed getting off the bus to walk around the historical sites and communities. The accommodations and meals provided on the tour exceed my expectations. "There were quite a few "Wow" moments - visiting the first church dedicated to the Virgin Mother in Rome, the surprising magnificence of the little church next to our hotel in Rome, the boat trip in Vieste that including exploring grottos, Museo Cappella Sansevero's stunning sculptures, the private boat trip to Amalfi, the groves of olives, lemons and artichokes, watching fishermen repair their nets & lay their nets in Vieste, pastries at our hotel in Vieste." It was more than I could have even imagined! The itinerary was amazing. Our tour guide was fun & knowledgeable. The group was great & got along. "I loved Vieste! It was beautiful & we had great weather. The family owned hotel was great & the family was so nice & helpful. We were able to take a boat ride along the coast & it was so beautiful! Later we had a pasta demonstration that was really fun & several tour members joined in on the fun!" The tour was a nice mix of small cities and big busy cities with scheduled activities and time on our own. The historical information regarding southern Italy was very interesting. "The contrast between Vieste and Matera vs Amafi Coast and Naples was a wow! Some of my favorite experiences were the boat ride along the Gargano Coast, the wine tasting in Alberobello and the free day in Sorrento where we spent the day on Capri." This was our third Rick Sreves tour, and it was another wonderful experience. Our tour guide, Patricia, did everything possible to coordinate every detail of this tour, and added several "extras" that we did not expect. As with the previous tour guides, she was dedicated to making the tour memorable for everyone in the group, while addressing individual needs when necessary. The locations that we visited were fascinating. The Hotels and restaurants were experiences to never forget. "There were 2. We were invited to have dinner at the home of Theresa and Luigi in Sorrento. Then, we were invited to the apartment of Luigi and Guiseppi for aparativo in Naples. Their hospitality made for 2 wonderful experiences we'll never forget. These were experiences that cannot be had in a restaurant. Really special!" I felt the tour gave us a variety of experiences/ sights. We made pasta, gelato, had a lovely home visit and meal with a local family, Greek Temples, Roman ruins a boat ride, wine tasting, small towns and a different side of Rome. Our journey went beyond a normal tourist experience and offered us a sample of the rest of Italy not usually visited. The Capodimonte Museum and Naples Archeological Museum are outstanding in the quality of exhibits. "Oh the food, or I would have to say Matera. The city was so different, ancient looking. Our cave hotel room was fun. I felt the whole tour was a big WOW. Even driving into Positano on the Amalfi Coast was an experience." I was not sure what to expect in Southern Italy tour[INVALID]only that it was likely to be different from tours we experienced in the north. I was delighted by the variety of experiences, variations in food, and the pace. The guide was FABULOUS! "It is hard to pick a single moment---perhaps staying in a "cave hotel" in Matera or seeing the amazing Greek ruins at Paestum." "Hard to pick one favorite. Our private boat ride from Positano to Amalfie was spectacular! Pompeii was amazing - the local guide there was very good! The 'veiled Christ' in Naples church was a big WOW!" "My favorite WOW moment was Paestum. The Greek ruins were incredible and the museum with the Tomb of the Diver was so well preserved and really showed what life (ok, death) was to the ancient Greeks." It was a very exhausting trip but absolutely worth every ache and pain. Nina was an amazing guide. I learned so much on this trip about the history of Italy. "Seeing the "Veiled Christ". It was awe inspiring. I never heard of this piece of art nor had I heard of the artist. It moved me even more than seeing Michaelango's "The David" 9n our last trip to Italy. I was speechless!" Really enjoyed seeing the sights and learning more of the history of Italy. "I really found Vieste relaxing and beautiful. The boat ride was also so invigorating and gorgeous." Fantastic! Amazing sights, experiences, food, and guide. Our 6th RS tour and one of the best. This was the smoothest tour as far as transportation issues, connections, etc. Physically is was the most strenuous but the sights were well worth the effort. Highly recommend this tour! "Too many. Certainly the ruins at Paestum and the cave homes of Matera were awe inspiring. The views from Positano were amazing. If I had to pick one it would be Pompeii. But really it was the people we met (dinner in an Italian family's kitchen and drinks with Nina's friends) that created a real WOW." The diversity of experiences was fantastic! From experiences in large cities to quaint small towns, to seaside cities, to ancient ruins, to unusual cultural experiences, it was an amazing journey. Our guide was very knowledgeable and an excellent leader. It was a great combination of arranged experiences, sightseeing, and free time. "Two moments for me were the "Veiled Christ" sculpture in Naples and the cave dwellings in Matera." The tour was great. Very thoughtful itinerary and pace. I would suggest not promoting the Roman spa in the Matera Sassi hotel. It was not worth the money and spa experience had much to be desired. I know it's not part of the tour but quite a few tour members went based on the tour guide's recommendation/promotion and we were all disappointed. "My favorite Wow moment has to be the boat cruise in Vieste. When the boat went into the first grotto, everybody's jaws dropped. What an experience!" Had a wonderful time. Southern Italy is so beautiful. Our group was a lot of fun to be with. The activities were very interesting and fun. A great experience that gave me a very good sense of what Italian life is all about. "It is hard to pick a single wow moment from the trip, but visiting Vieste was wonderful. The boat ride we took, visiting several grottos and enjoying the beautiful coastline, was a highlight. The weather cooperated, and we also had the unique experience of rescuing a bird during the boat trip. Also the festival and concert that happened while we were there was a lot of fun." This is our 3rd RS tour. We ended our tour last year in Rome so we picked this tour to continue where we left off. It did not disappoint. Nice group of fellow travelers. Rick Steves tours give us access to places we could not get into by ourselves. Loved that this was sort of a foodie tour with lots of beautiful scenery and early enough in the season that the crowds were not crushing. The weather was +/- 70° with rain parts of a few days. We even liked Naples. "No one "wow", but loved the many fantastic views, the food, and our fantastic guide Catherina Moore who happens to be a chef and a fellow foodie. Overall it would have to be Vieste. We happened to be there during the festival of Santa Maria. I really enjoyed our stay and meals at the family-owned Hotel Seggio. The boat ride along the Gargano coast was beautiful too." This was my third Rick Steves tour & it surpassed my expectations. I knew it was going to be great but I had no idea what wonders I was going to see and things we would be doing. Caterina did an amazing job. "This tour should be called The Tour of Wow's. There are so many things to pick from one just doesn't do it justice. Guess if I have to pick one it would be looking across at Matera and seeing the Sassi Caves for the first time. Beautiful!" I found it strenuous. I picked this tour because it took me places that other tours did not. 4 months before this tour I joined a health club and began to work out 4 times a week. That helped but my knees, legs and feet hurt for much of the tour. I liked all the places where we traveled. It only duplicated 2 places I had been previously, Pompei and Sorrento The museums in Naples were great. Pina, City tour guide was very helpful. "So much to choose from on the Southern Italy tour. I think maybe the boat tour of the grottos in Vieste. The grottos were great and better experience than blue grotto. We were heading back to port we came upon group of gulls. They were attacking a bird in 5he water. When our boat approached one of our fellow group members was a veterinarian and identified the bird as a buzzard. He was able to pull the bird (who was struggling to swim and unable to fly) into the boat. Authorities were notified." It was more than I expected! Wonderful and extremely educational! Very well organized. The off the beaten track of Rick Steve's Tours is great. The guide was very personal and knowledgeable in ever aspect of the tour. Had a lot of fun, interacted with new friends and gained a lot of knowledge on Italy. "The home made meal at a personal house in Serrento." i got off the plane with a heretofore unknown sciatica problem. i told caterina about it at our first meeting. she did everything possible to make the tour easier for me, including arranging for rides to and from the hotels where luggage was taken from the bus to to the hotel by truck. she could have taken a 'too bad for you; you knew this was a strenuous tour' attitude, but instead she helped me enjoy the tour as much as i was able. i also liked the use of radios. "rescuing the buzzard was unforgetable. second best was was seeing the marijuana energy drink signs. oxymoron much?" I really enjoy the South Italy Tour. Every day offers a unique experience. "Vieste and The boat cruise to see the hidden grottos in the Adriatic Coast." There's no other word: WOW. This was our seventh R.W. tour and one of the most fun, varied, and educational. "Too many to count but it's hard to beat that first sighting of the Greek temples in Paestum." This was our 7th RS tour and perhaps the best! I say that because Caterina was able to really infuse us with Southern Italy. Overall the mix of sights and experiences being so varied was the key point. To be honest, I was not thrilled to visit and stay in Naples. Your guidebooks do paint a crusty picture - but Cat made it sing and I am so glad we went. "Without a doubt it was standing and looking at the temples at Paestum. I am an architect and that helped - but WOW. A second would have to be looking at the Roman mosaics in the Archeology Museum in Naples. A third would be the wonderful little Viesta. OK - water buffalo gelato is in there too. This tour was a wonderful collection of "wow moments" And having a laundry service organized for us was #1. Please do it for all tours." I joined this tour at the last minute and didn't have time to prepare both with language and the South of Italy! I was traveling alone and got to know the others as we traveled. I enjoyed everyone including my roommate. Cat- erina Moore made the traveling so natural and oriented around relationships that it was so fun, spontaneous, full of information, beautiful vistas, archeological treasures, and all wonderful people..the best of family! I challenged myself physically although SafetyFirst! "Trouble centering on one but I thought the surprise religious procession and Church service in Vieste, the swimming in the Adriatic, rescuing the bird from the hundreds of gulls and bringing it onboard our boat following the 7 Grottos....the little towers and the wine tasting and appetizers in Alborello by Gino and his father AND MATERA! Positano a true Italian meal overlooking the harbor in the sun..the dinner wLuigi&Theresa in Sorrento and NAPLES can't be beat!! Many WONDERFUL Memories!" The overall tour was nothing sort of fantastic. I am a 33 year old who is fortunate enough to travel with his parents. Ecauae of my job. I agreed to the tour and was just blown away but how much of Italy I had not seen. The culture, the experience, the feeling that you are really in the south of Italy away from tourists most of the time was wonderful. I highly enjoyed the experience. "So much to take in. I loved so much of it the trip was a Wow moment. I will say the Pompeii experience was incredible. The guide you had there was so much fun and really made the day for me." Our 8th tour, just as enjoyable as the others. Italy is a feast for the senses! The feast was enhanced by a fabulous guide, being with my husband and son, some really wonderful tourmates, my excellent buddy, and a packed intinerary that amazed me every day. Ending in Naples, where my beloved mother-in-law's family came from, was the frosting on the cake! Pizza in Rome and Naples, amazing pasta, wine, cheeses, bread, sfogliatelle, gelato, limoncello spritzes--yum! And I didn't gain a pound! "Wow moments every day! The layers of Rome, the feast days in Vieste, the grottos on the Adriatic cruise, the sea bird rescue, trulli houses and sasso hotel rooms, Paestum and Pompeii, the beauty of Positano, the Sorrento family dinner, the veiled Christ, the energy of Naples, the food and wine, the passion of the Italian people. This tour is all about "wow."" We saw and visited different places and people the South of Italy from museums in Rome and Naples to small shops in Areobella and Sorrento. We saw ancient ruins in Hadrian's Villa and in Pompeii. We had dinner in a family home setting and by the sea in restaurants. We had boat rides and taxi rides. We walked a lot. My feet ache. It was a wonderful 13 days. Our tour guide Alfio was awesome. He was organized and friendly and informative. He told us stories. He played Italian songs on the bus. "My wow moment was the boat cruise along the coast by beautiful Vieste. My second wow moment was seeing the Greek temples in Paestrum." The best guide for this tour was ours this year: Alfio Di Mauro?? Not only did he know "his stuff", but he made every day informative and FUN! Loved the making mozarella balls on the farm and watching the black cows wander bbetween their stalls and then share in a fabulous 4-course lunch beautiful but then served us homemade gelato. Who would imagine that the cows could wander freely between stalls to get watered down. "Loved his "how to make pasta" a laughable special, but then he had the pasta chefs at our hotel demonstrate the way it is done! Such an eye- opener! We will never forget it?? The best treat was being treated to a homemade dinner by a native-born family of three generations who shared their Viking-like dining hall with our entire group. EVEN their two grandchildren mingled with the group with ease. Their 6-yr-old granddaughter asked if I wanted her to spell "soccer" in Engl. or Italian!" Álfio & the chemistry that he developed in the group made this trip unforgettable with a lot of pleasant memories for years to remember. We found Naples quite interesting & unique with a lot to offer once the city was introduced & got to feel the pulse & heart of what it had to offer. The accommodations were confortable, some unique. The bus drive pleasant & not too tiring. The combinations of the included lunches & dinners as were as some by your own always are unique experience. "Dinner with a local family, lovely Teresa & her family, in Sorrento. We were first received with open, friendly arms producing a banquet with local products from the region which were spectacular in amount, presentation, and taste. By that time the chemistry of the group was cohesive, friendly, & high that made that experience even better"
Great group and guide. Very diverse experiences with a surprise every day. Small crowds made each experience more pleasurable and more relaxed. Had a wonderful experience. "Matera. Unique tour and staying in cave-like hotel made for a very special experience." This was our fifth RS tour and it exceeded our high expectations. Not only was our guide fantastic and fellow tour members interesting, fun, and convivial, but the itinerary was exceptional. Each day brought awe inducing experiences. I especially loved the variety of landscapes, architecture, and historical ruins. "In awe that our large boat was so easily maneuvered into the magnificent grottoes in Vieste, I thought "This will be my wow moment." But then we drove through Alberobello and I was overwhelmed by the sheer number of trulli homes dotting the countryside and the charm of the restored trulli in the Rio Monte district. Oh THIS will be my wow moment." But then came Matera with its breathtaking gorge, cave dwellings of the Sassi, and touching history. That was the moment that surpassed all others." Just another very average great tour... A very interesting combination of outdoor splendor, museum highlights, local culture, and food, and wine, and gelato! The tastes of the fresh foods still linger. And everything was enhanced by the fellowship within the group. "Watching in awe as our boat tour entered the narrow openings of grottoes along the Gargano Peninsula." I have traveled quite a bit, but this was my first group tour. I was skeptical. My experience was great. Good people. OUTSTANDING group guide. We saw places in South Italy that I don't think I ever would have found on my own. Great exercise, too! "Matera was an eye-opener. And I loved the Amalfi Coast, Sorrento and Positano. Naples was terrific, but Pompeii was the WOW for me." "Naples was a wonderful surprise." It was a wonderful experience, This is my second RS tour and they were equally enjoyable. I arrived in Rome 4 days early. Stayed at Hotel Smeraldo; great digs, delicious breakfasts, clean, and staff very hospitable. Our guide was very well acquainted with Italy (and Sicily), had a great sense of humor, and was very knowledgable about the tour and site visits. Guest guides were great. You recommended Carla in Rome as a private guide. I learned so much as she guided me on my own in Rome. "Probably the visit to Matera. It is shocking to know that the residents lived in such poverty and were so ignored by their government. The Greek temples were much more awe-inspiring that I expected. The architecture, history, and hugeness of them was amazing. There were so many Wow moments. Its difficult to single one out. It was a WOW trip." I loved this South Italy tour! My father was born in a small town outside of Foggia and I planned this trip to see where my family lived. Every town we visited was a great adventure! The trip was well organized and our guide, Alfio, was fun and knowledgeable. The ruins were informative, the boat rides along the Gargano Coast and Amalfi Coast were beautiful, the caves in Matera were unreal, and the big cities of Rome and Naples were full of history. "Every day was a "wow" moment, but my favorites were viewing the remarkable "Veiled Christ" statue in Naples, all the fountains in Rome especially "The Four Rivers Fountain", the tiled floor at St. Michele Church in Anacapri (be sure and view from the balcony), and the spectacular "Michelangelo's Pieta" in St Peters Basilica. The emotions I experienced while viewing this masterpiece as a mother are beyond words." Loved everywhere we visited! Loved our tour guide and the group we traveled with! Saw and learned so many new things, and enjoyed those things and places that were not new from a different perspective. "Its hard to choose! There were so many wow moments for me on this tour! But I'll choose the Gargano Peninsula and coast line boat tour. It was so beautiful! I will go back to Vieste if I have the chance." "I guess it would be Pompeii, but it is difficult to choose one "wow" moment." I worked in the construction industry before retiring and took this tour to see how the Greeks/Romans lived and to look at their construction. I not only accomplished this goal but found many more interesting experiences, such as exploring the many beautiful Duomo's and visiting the Capitoline Museum and the National Archeological Museum in Naples. "I especially enjoyed walking inside the temples at Paestum. It was amazing to see the construction up close and to think that we were walking on the same ground as the ancient Greeks." Well organized, great tour guide, great blend of structured time and free time, what more could you ask for? We loved our starting spot in Trastevere. We enjoyed reconnecting with Francesca Carruso, our local guide on a previous trip. "We loved visiting Vieste on the Adriatic Coast. It is my new favourite spot in Italy." "Matera, buffalo farm, and Vieste"
This was my 7th trip and I have experiences from all of them. Each guide I have met has done a great job in their own way and all have fit into the Rick Steve's system in a unique way. Ann was no exception. She is a very experienced guide with a personal knowledge of Italy that worked well with the group including the people in our sub group that we were introducing to touring with Rick Steves and Italy. "No WOW moments for me although the Amalfi coast would be close. Sorrento & Positano were my favorite locations, Rome and Naples my least but still well worth the visit." This was my fourth tour with Rick Steves. I really enjoyed the way the tour leader and local guides fill in the blanks and add context to the many places we visited. "While the tour was filled with"WOW" moments. For me the moment that left the biggest impression on me occurred at the beginning in Rome. Our local guide met us at the Capitoline Museum. It was the passion she brought to viewing the antiquities that stood out. It is easy to look at a fresco, mosaic, statue or painting and appreciate its artistry. But, to imagined these pieces in there original setting is truly eye opening." Ann was a terrific guide. She made the tour fun, social, educational and comfortable for us. She anticipated our needs and smoothed our way in often busy places. Breakfasts and other group meals were delicious. Local guides were also very good. "Lots of those. I had expected Pompeii to be a Wow time and I wasn't disappointed. The tour of the Capitoline Museum in Rome was outstanding. Of course, bus rides on winding roads were a thrilling experience balanced by amazing coastal views." What's not to like? We experienced a well [INVALID]d tour plan with great sights, wonderful food, comfortable transportation, and good hotels. The lead guide (Ann) was outstanding with a wry sense of humor (and she speaks Italian with a Chicago accent!). Local guides were also top notch, especially Francesca in Rome[INVALID]-she has changed the way I will experience a museum for the rest of my life. The most delightful surprise was our group of fellow travelers[INVALID]-interesting, congenial, and fun! "Views from walking paths Sentiero Degli Dei on the Amalfi Coast and Sentiero Dei Fortini on Capri"
Excellent choices of hotels, transportaion, meals, tour stops in Southern Italy. The size of this tour group, 28 tour members, was a problem. I have been on quite a few tours to various countries and this is the largest tour group I have toured with. This seems to go against Rick Steves' philosophy. Unfortunately there were several women and several men who looked very much alike. We begged our tour leader, Ann, to please let us wear name badges because we were all having problems remembering people, and we are in our 60's and 70's and don't remember as well as we used to. "Rick Steves does not allow that, so she took photos of us and made a page of small pictures and names. At the very end of the tour people were still having problems remembering names and who went with who. Because of the group size, people starting separating into sub-groups which does not help us get to know each other. The group size particularly caused a problem in Naples with our local museum guide, Pina. She is very good, but she had a time schedule to keep and could not herd 28 people." AMAZING! I loved every minute of my tour and I especially loved my tour guide Ann. She was truly a delight!! "Hmmmm....too many to count. I really loved going to dinner at the private home of Luigi and Therese. That was something I will never forget. I really loved all of the hotels we stayed in, all of the staffs were fantastic. Matera, I think though was my favorite. Learning the story of this town was just fascinating and something I knew nothing about." Beautiful scenery and excellent tour guiding by Ann. Learned a lot from Ann. All the hotels were very good and the one in Positano was the best. Thank you. "Looking down the cliff at the Amalfy Coast and the sunset in Positano." The tour was very well organized with great sites to see, good dinners, and good hotels that we were in for two nights. Bus travel was very manageable and not too long. The tour guide, Ann Long, was exceptional. Because she has lived in both Italian and North American cultures, she was able to bridge the gap for us and tell us how the same things compare between the two. She had a good sense of humor and told us interesting information as well as keeping us on track legistically. "The 5th century Greek temples in Paestum were a real wow. Visiting 2 different local homes for 2 evenings was very enjoyable (thanks to Ann's contacts) Materra was a real wow, had to believe people lived like that up until recently"
Loved being looked after. Having admission to sites and museums included. Enjoyed the guided tours with the local expert. The planned itenary was well worked out, visits to sites enroute to that evenings destination broke up the bus ride. "The Colosseum and Pompeii we definitely highlights. Would have enjoyed spending more time in Pompeii. Our guide was excellent. One draw back was that we happened to arrive at Pompeii on the 1st Sunday of the month which is free to all. This made it very crowded. Couldn't be helped." This was my second RS tour so I wasn't quite sure if my first one was just the experience of a lifetime or if indeed all RS tours really delivered what they promised. Well I'm 2 for 2. I've never been south of Rome so I knew this tour was perfect. Each town was mesmerizing in its own way- the history, the food, the sites and of course the views. Until Naples. What a disappointment. Garbage everywhere and graffiti even on their churches. Should be a day stop to grab a pizza and see the museum. "My favorite "wow" moment had to be the town of Matera. I didn't do any research before, as I like the feeling of arriving in a town for the first time and all that that entails. What a site! Between our hotel and our walking tour with our local guide I was totally mesmerized. We just had to watch WonderWoman on the plane ride home!" I have travelled quit a bit on my own for many years and have been skeptical of tours but you have won me over. I learned so much about the culture, the people, the art and architecture, that no amount of research could have duplicated. I have used the Rick Steves books for years and they have enriched my travel experiences and have helped tremendously but the Rick Steves Tour of Southern Italy took things to a whole new level of understanding and appreciation. "It is hard to pick just one "wow" moment but here are a couple of standouts: Caterina was a wonderful guide, so knowledgable, so many insights to southern Italian culture, and so many fun and unexpected surprises. The trip simply would not have been as wonderful as it was, without her. A meal recommended by Caterina at Tratorria Antiqua in Sorrento, simply one of the best dinners I've ever had and in a great setting to boot. Francesca's tour of the Capitoline Museum was outstanding!" Overall, the tour was enjoyable. Our tour guide was very knowledgeable, helpful and friendly. Most of the locations we visited were very beautiful and we enjoyed seeing all the incredible history that southern Italy had to offer. "We really enjoyed the beauty of Positano! Just relaxing in such a beautiful place and celebrating our anniversary there was something we will remember for years to come. We also enjoyed the beautiful grottos we toured in Vieste. It was an unexpected treat! The home cooked meal we had in Sorrento was wonderful. The family was so welcoming and friendly and the children were delightful! It felt like we were really having a delicious family meal." Very enjoyable, terrific group of travelers. Terrific excursions. The organic Buffalo farm was very interesting. "The Amalfi coast and the Grottos. The family hosted dinner. Sorrento & Pompeii." We had a great overall experience. We seemed to run into a lot of Italian Holidays during our tour which was both a blessing and a curse. Some were great experiences to mingle with the locals and others were just a crush of people. "My wow moment was in Vieste sitting on our balcony watching the fireworks display for St. George's Day." Amazing! We had never gone on a tour before and were so pleased with our experience. Catrina our guide was wonderful and our itinerary was fabulous with one exception, Naples. "Probably Pompeii, but I didn't realize it at the time we visited the site, it wasn't until we went to the museum in Naples and I saw the scale model of Pompeii and watched the video and saw all the amazing statuary that I was really blown away by the scale and importance of Pompeii." I've been on 3 RS tours. All of them in Italy. This was my least favorite. The bus was quite a bit smaller than the bus we had on village Italy Tour. Very cramped. "Arriving in Vieste to the celebration of St. George. There were concerts and fireworks. The town people were all out till very late at night. So fun watching the kids, families and friends interact. The women were dressed up in red from head to toe. We sat on the Piazza and did as Rick says......totally embraced the experience. It was truly amazing." This trip was marinated in WOW moments. Effervescent is the key word!It bubbled with wonder, joy and cultural exchanges. This was our 6th RS tour and it did not disappoint (none of them has). This tour allows you to dip into Italy's deep roots, helping you to better understand and respect this country's culture, foods, love of family and the sweetness of doing nothing. You can easily become a "pleasure activist" on this tour (thanks, Fred Plotkin, for teaching me this concept)! "So many...but probably my favorite is the dinner at Luigi and Theresa's home in Sorrento. The warm welcome by Luigi. The table, laden heavy with countless anti pasti delights, told us we were in for a feast. But as the evening began to unfold, I began to realize the real gift being given here. It was a snapshot of love. Really. The entire family ate, laughed, danced and sang together. Such joy and such an honor to see this slice of Italian life." I chose this tour to give me the opportunity to visit areas of Italy that I would find difficult to do on my own. The tour lived up to my expectations. We visited Matera with its cave dwellings, Vieste with its beautiful coastal cliffs, and the city of Naples with its museums and the nitty gritty city life. I also enjoyed staying in the towns of Positano and Sorrento which were both beautiful and must see for anyone who loves Italy. "The drive in to and out of Positano were wow moments for me. Truly beautiful and unforgettable." This tour experience was wonderful. The itinerary was great and we saw so many new and exciting places and sites. Our guide, Caterina, was everything we come to expect in a Rick Steves' guide. She was well prepared, very well versed in all the specifics and her educational background of Italy and personal experiences only added to the value of our trip. This was my 4th RS tour. We've had nothing but the best on each. Caterina was the master of nice weather and so approachable at all times. "Wow moments are so personal and this tour was full of them. We loved each place we visited and found "Wow" moments in each. Francesca is the be best local guide of all and made the history of Rome come to life. Our boat rides in Vieste and along the Almalfi Coast. The wonderful family dinner is Sorrento was a big highlight and the Veiled Christ in Naples was beyond belief. So many to mention." "I would have to say Pompeii. I had few expectations, and was blown away by the size, scope of the town. Seeing the preserved artifacts in the Naples museum tied it all together." The overall experience was very good indeed. Caterina took very good care of us all and was never cross or upset, even though she had a cold (or possibly even a flu bug) part of the time. When I got "the cold" she was very helpful in recommending the appropriate cold remedy and then following up with questions about my progress. She is obviously very knowledgable about the routes, the history, the thrills of the places we went, and she instilled her enthusiasm in the group. "I believe it was seeing the marble "veiled Christ," which is perhaps the most breathtakingly beautiful statue I've ever seen. It was so tenderly rendered, so touching, and it was amazing the artist could render that tenderness and delicate fabric in marble. It also made me want too learn more about the Masonic movement"
In case you wish to book pre- or post-tour hotel accommodations, the contact information for the tour's first and last hotels is included in your tour confirmation email, as well as in your online customer account. About one month prior to the tour departure, in your customer account you'll find the directions to your first tour hotel and a complete list of hotels where we'll be staying while on tour. Our tours don't include airfare, so your flight arrangements are completely up to you. Most tour members arrange to fly into Rome and out of Naples ("multicity" on flight-booking websites). Booking round-trip to one city will require a connecting flight, train trip, or additional overnight stay in Italy. Please note: The train from Naples to Rome takes from 70 minutes to two hours, so avoid early-morning flights out of Rome. We suggest arriving a day or two before your tour begins to allow ample time to get over jet lag and be well-rested for the first few days of your tour. For more information about transportation options for getting to and from your tour, see your Rick Steves Italy guidebook.